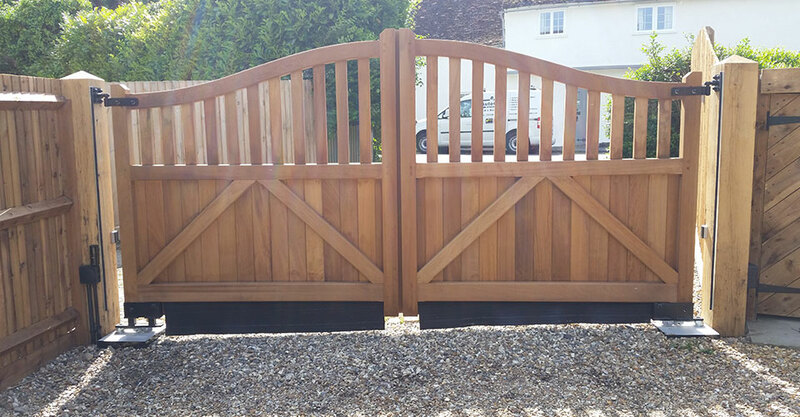 From all wood, or metal to a combination of the two, we are sure to have a made to measure style to suit your property. 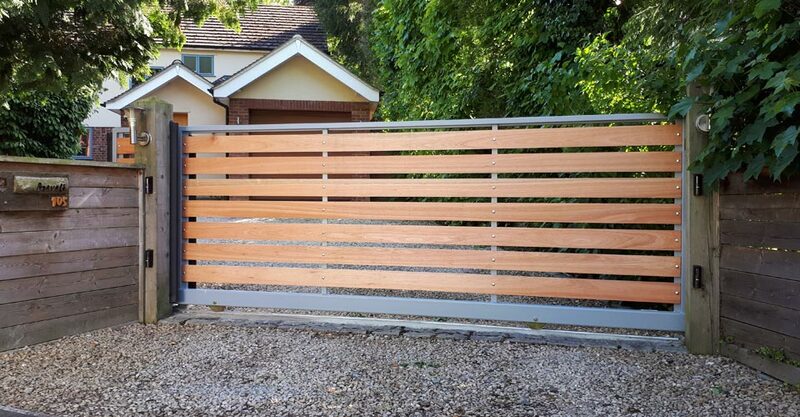 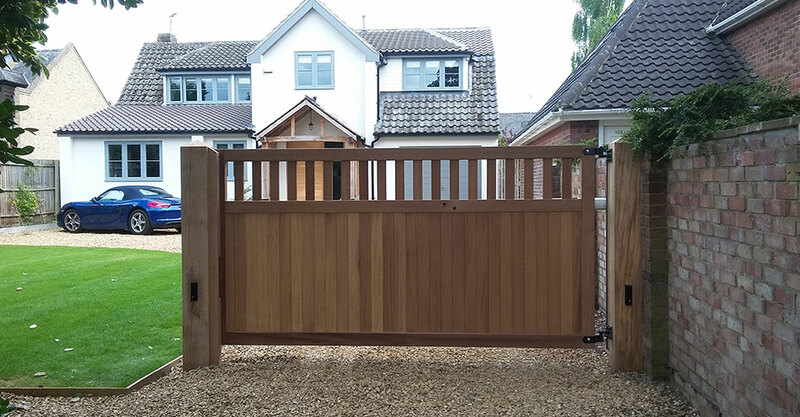 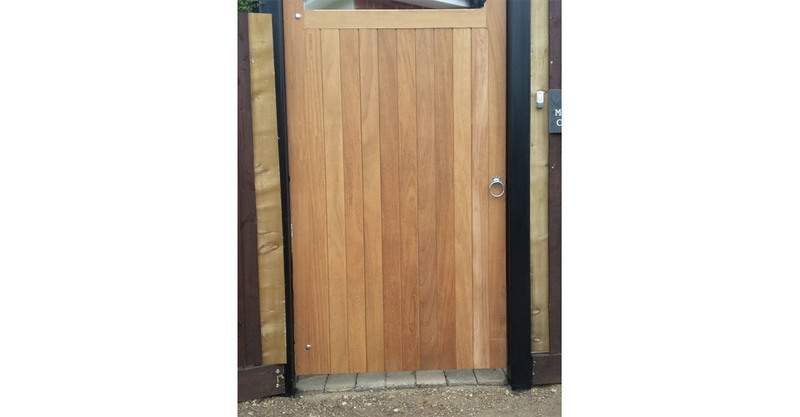 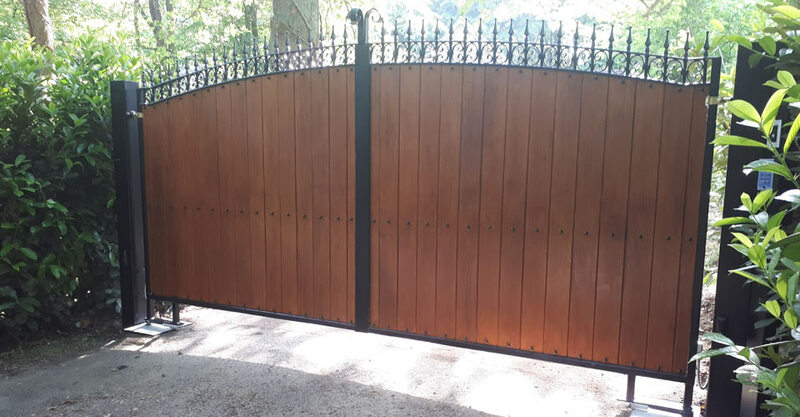 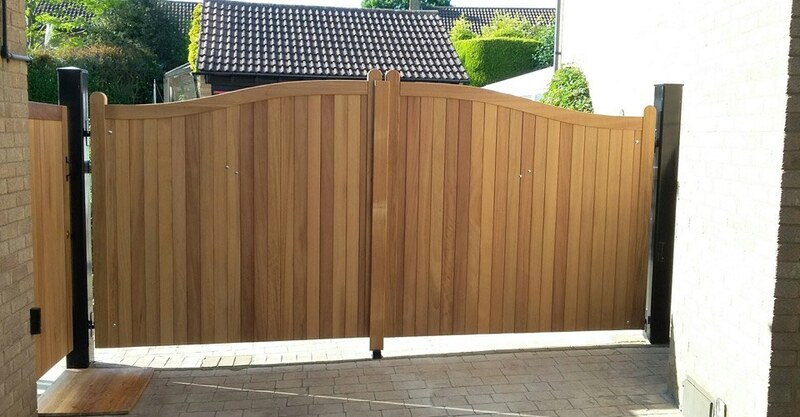 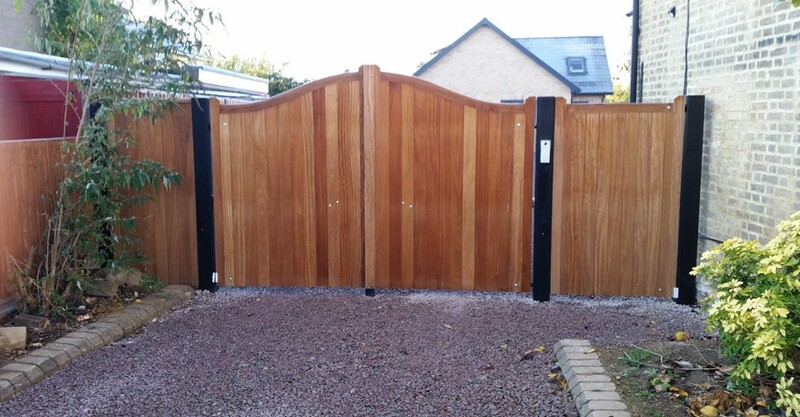 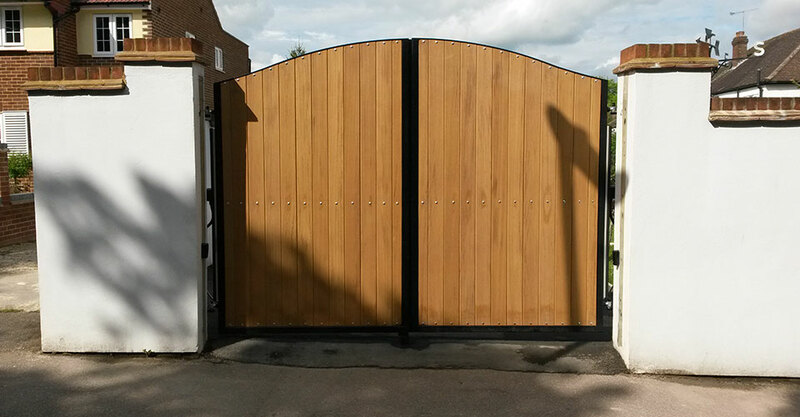 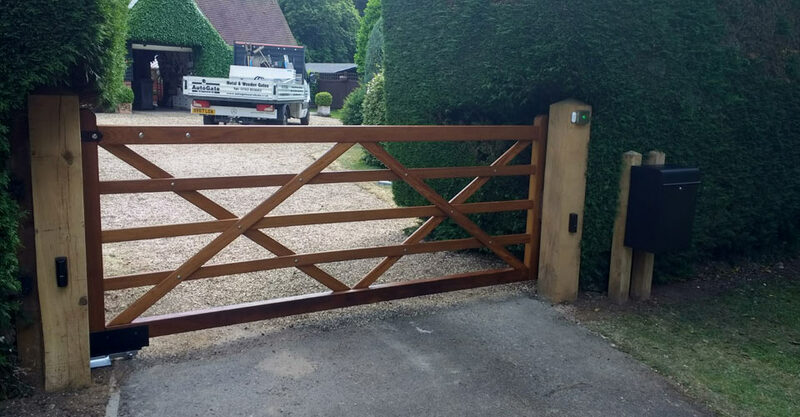 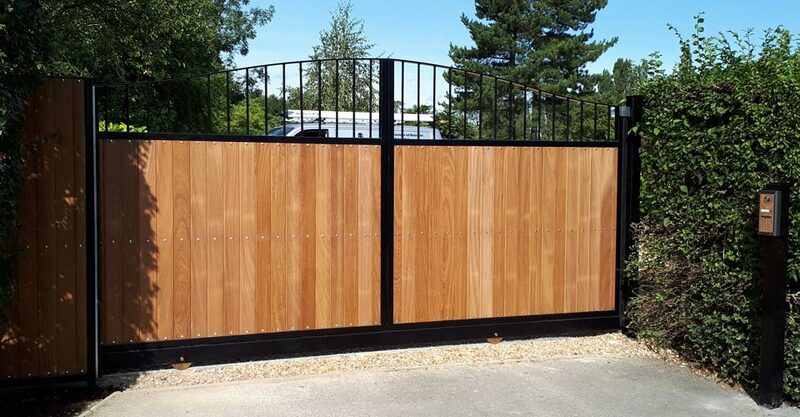 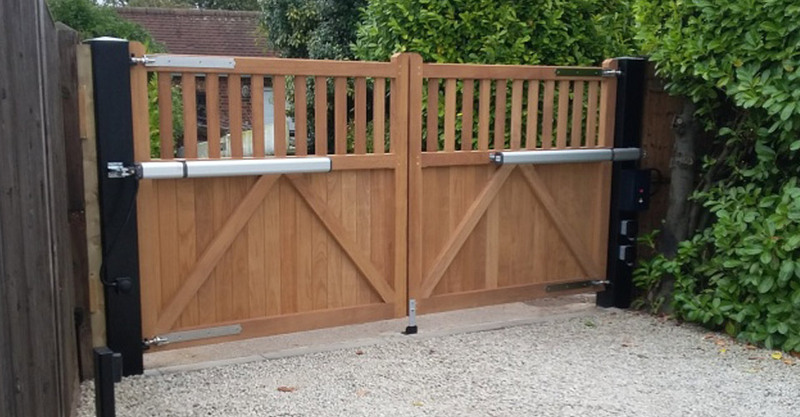 A stylish yet practical combination of both metal and wood, this gate style was born out of our customers’ desires to have a gate with the longevity afforded by a 50mm metal frame which is then clad in either soft or hardwood. 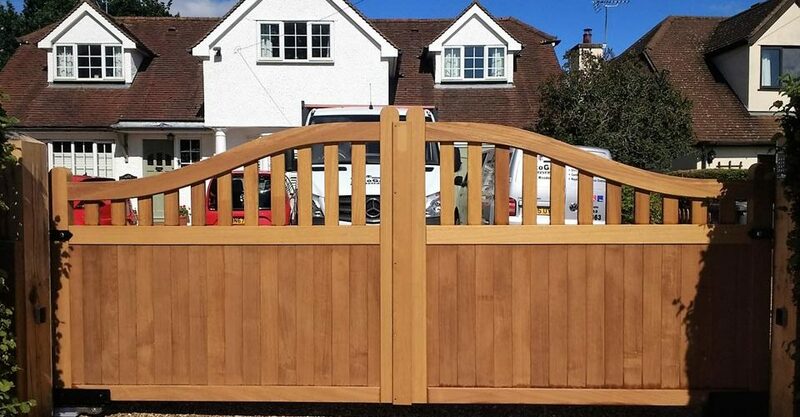 As the wood can be replaced at any time without compromise to the frame, some clients prefer this option, which allows the tongue and groove sections to be easily replaced in the event of any damage occurring. 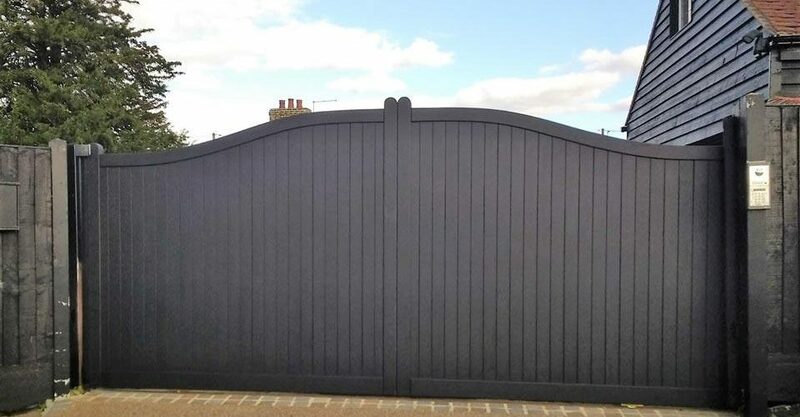 The metal frame is powder coated in a satin or gloss finish, and although black is the most popular choice, you are able to choose from a wide selection detailed in the RAL colour chart. 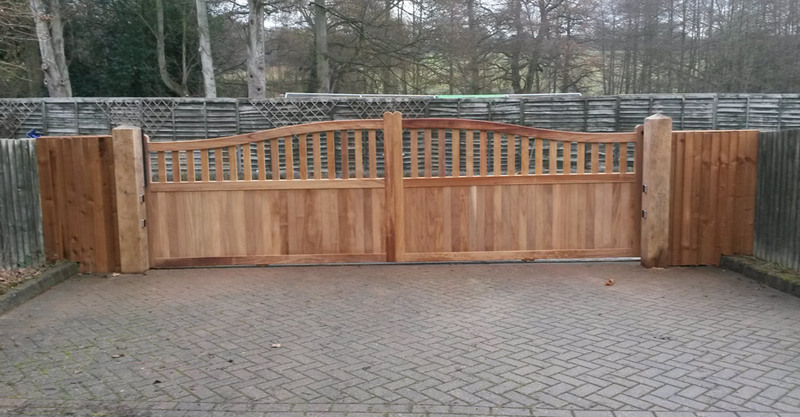 Timber comes untreated, and can also be supplied oiled or stained. 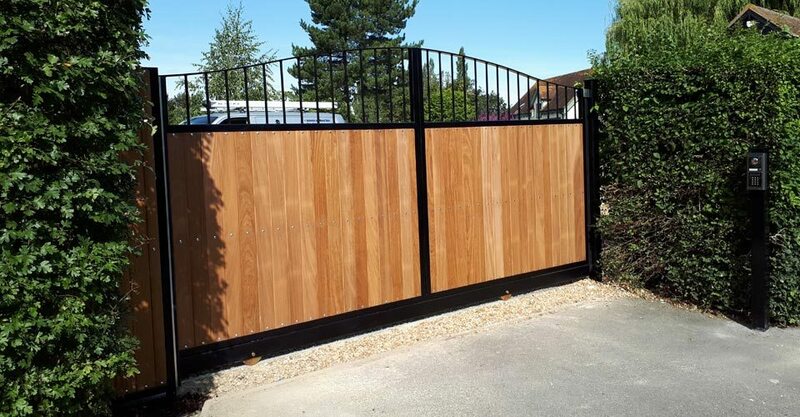 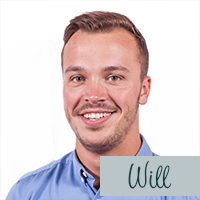 The wood is generally applied to just one side of the metal frame – keeping costs low – but can also be fitted on both sides to fully enclose the frame, leaving just the edges visible. 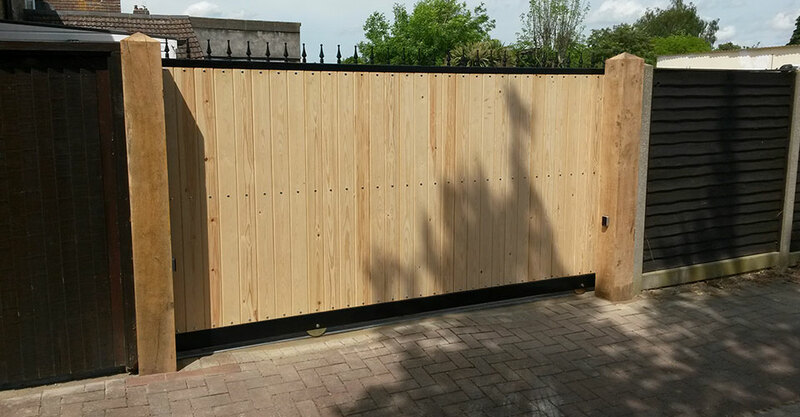 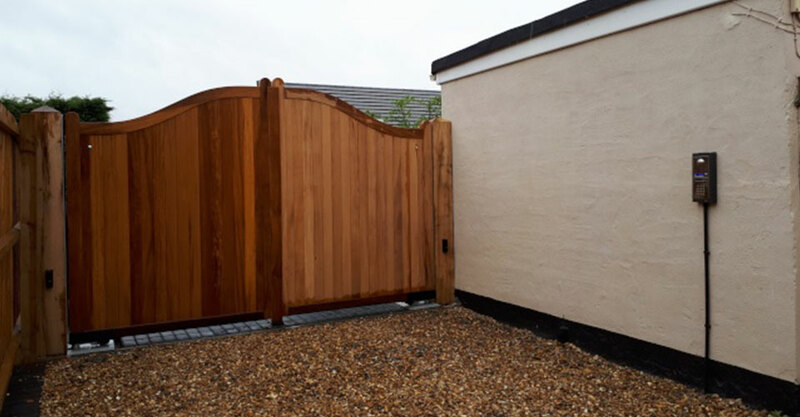 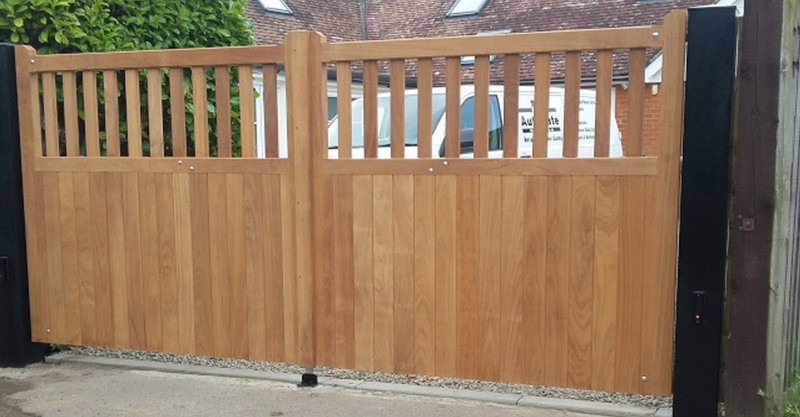 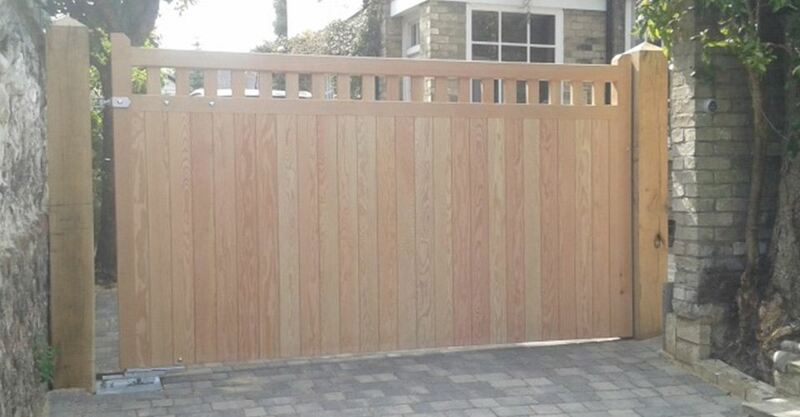 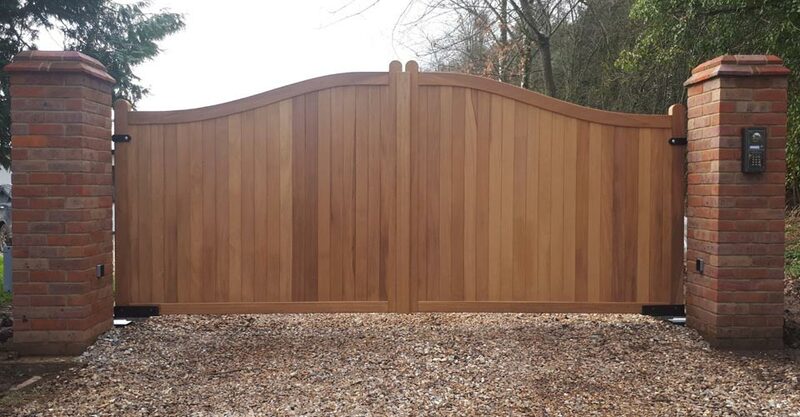 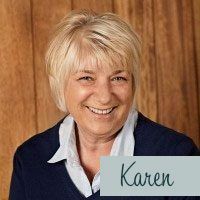 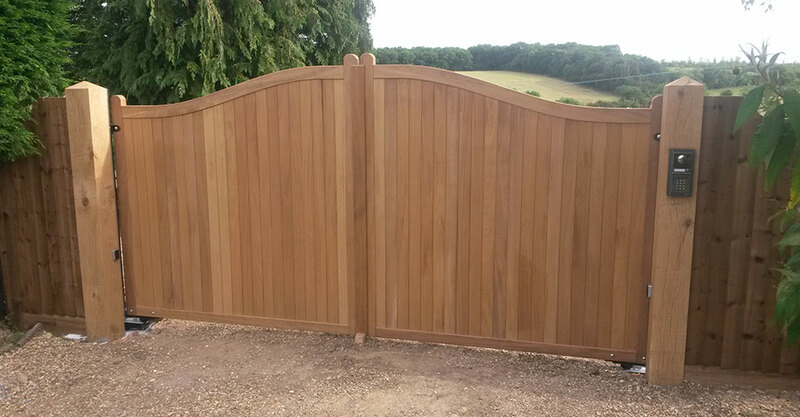 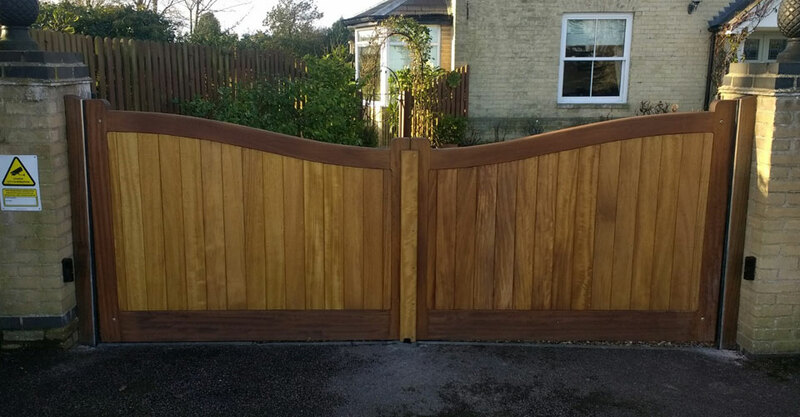 The Morden gates are made bespoke to your specific design and as such, the softwood or hardwood cladding can be laid vertical, horizontal and diagonally – with or without gaps – to create the style you require. 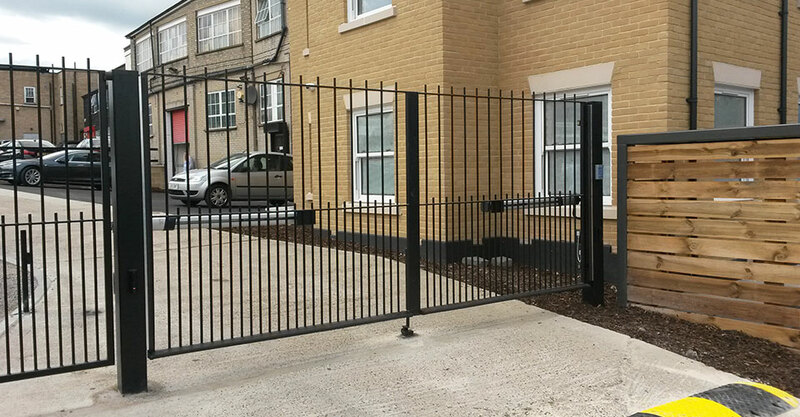 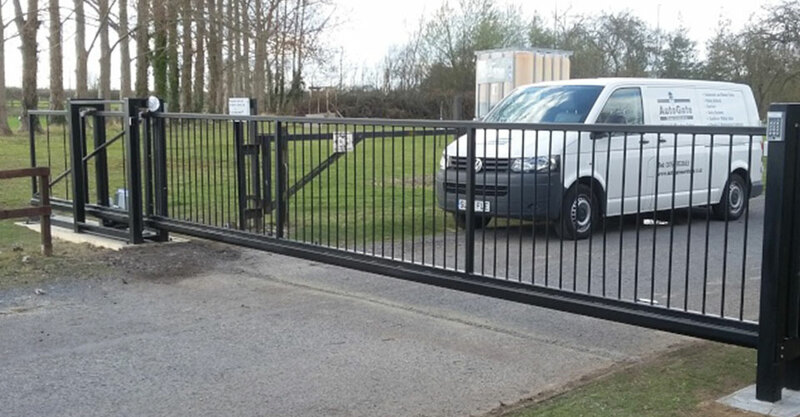 Since it can be fully boarded or with metal pales/rods to allow some visibility both in and out of your property, as well as being available as a pair, or a sliding gate this range continually proves to be an extremely versatile option for any property. 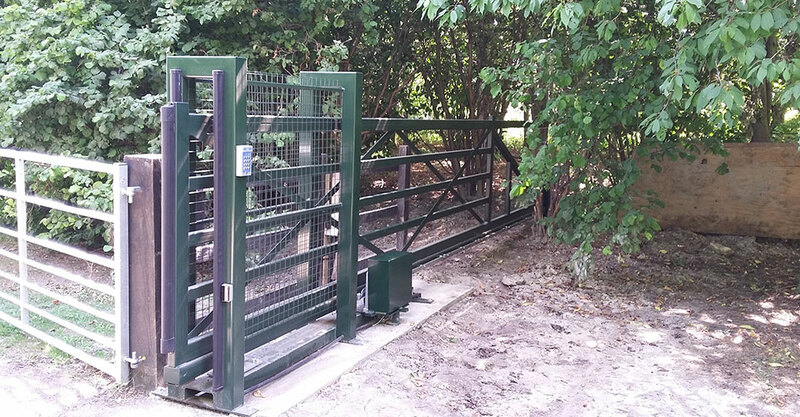 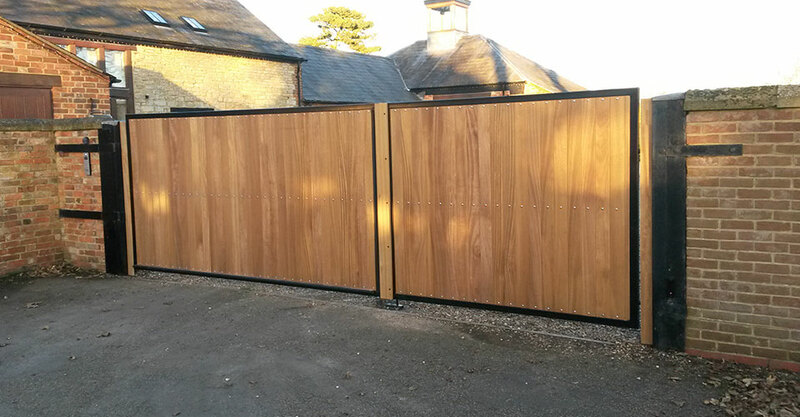 Maximum width for Morden range is 4.5 metres as a pair and 5 metres as a sliding gate. 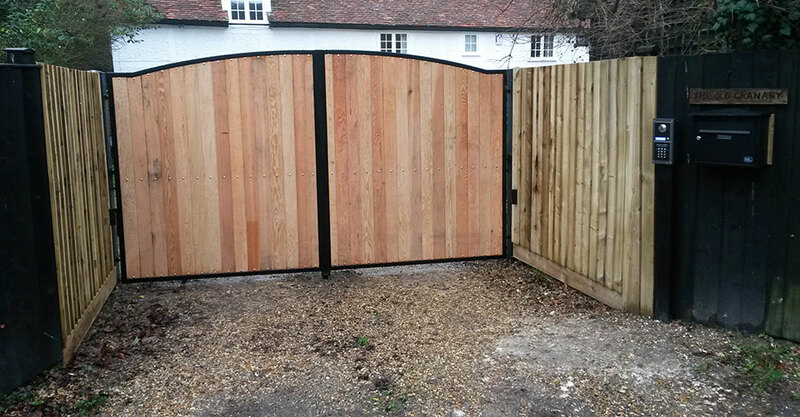 A straight-top metal frame fully boarded gate, creating a high level of privacy. 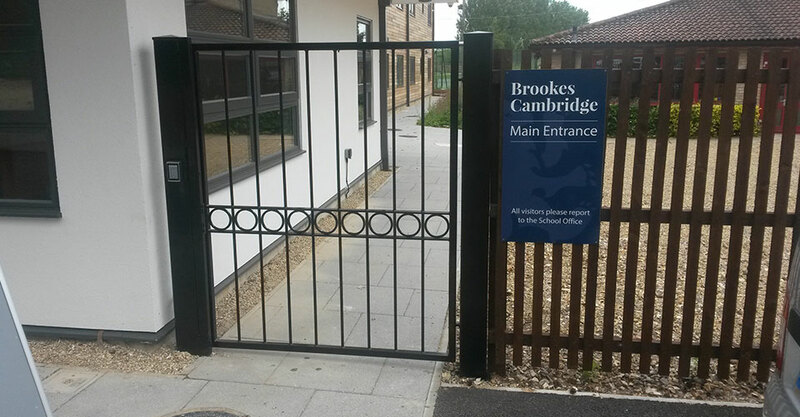 A metal frame fully boarded gate. 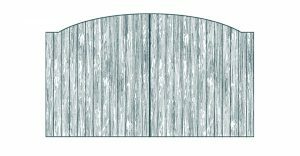 Starts lower at the shoulders and rises in the middle to create an upward bow effect. 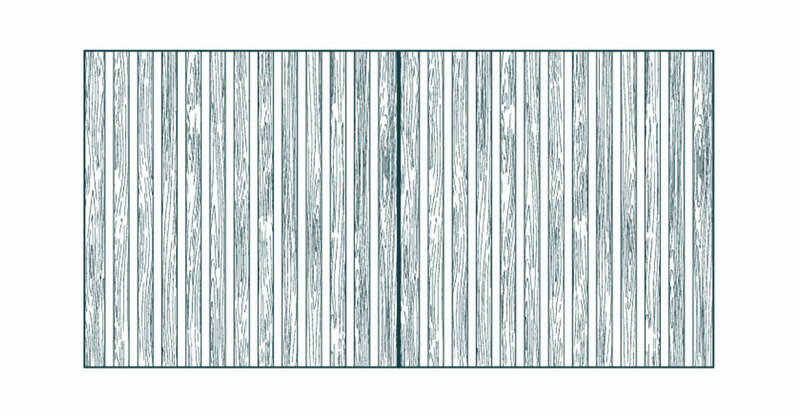 It is full boarded for total privacy. 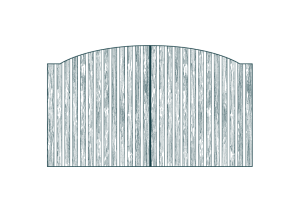 The Shillington fully boarded gate is the reverse of the Hinxworth being higher at the shoulders, and bowing down in the middle. 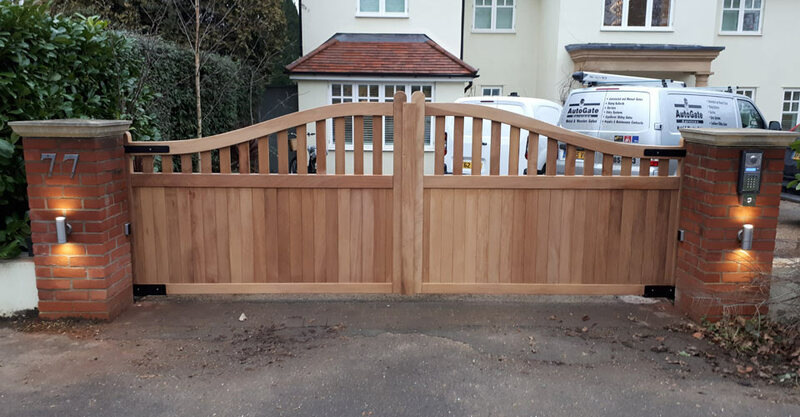 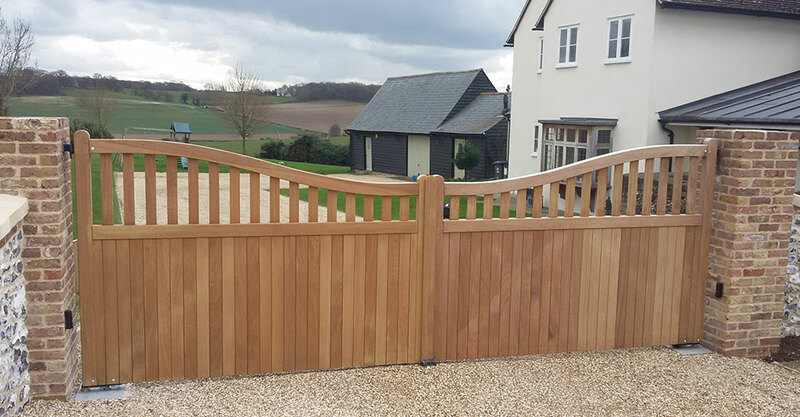 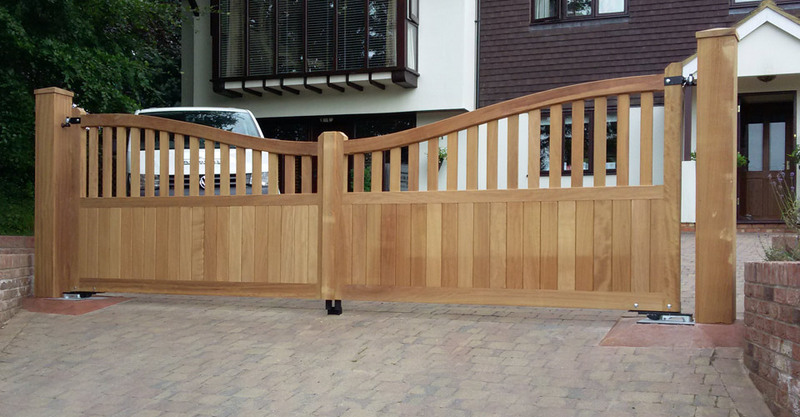 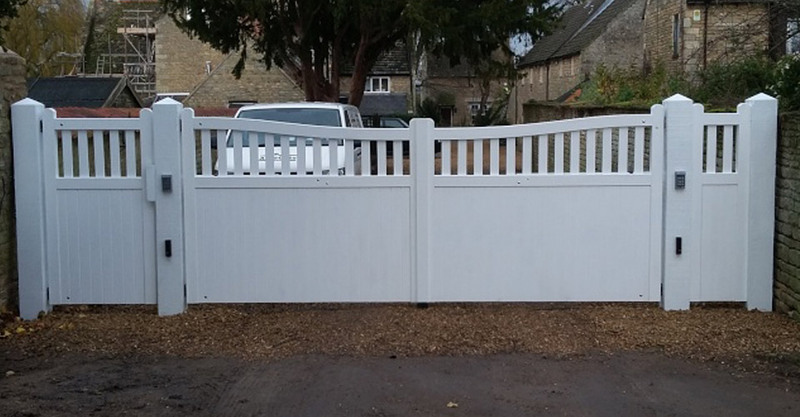 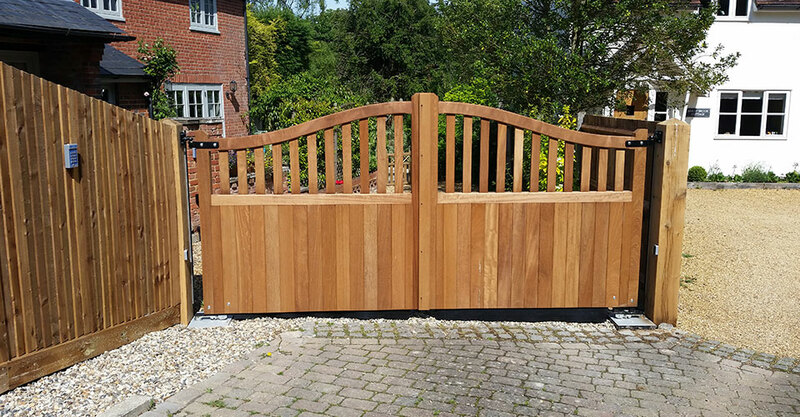 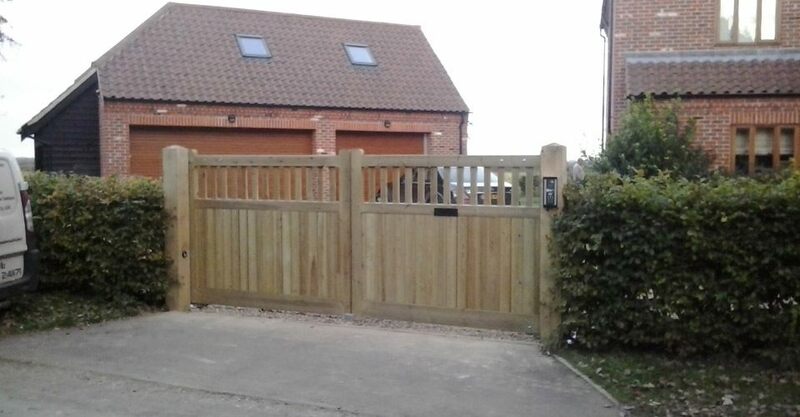 Mirroring the Kneesworth with a straight-top, this design has a space between each of the tongue and groove boards to provide a modern twist on the more traditional gate styles. 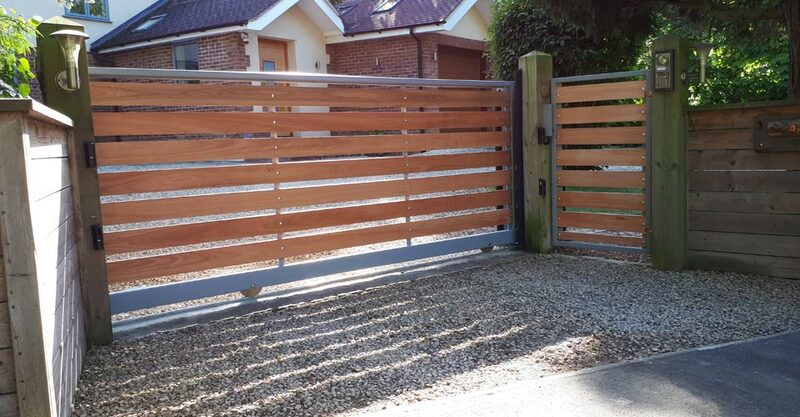 With precise spacing between the timber clad making for a ‘gap’ effect. 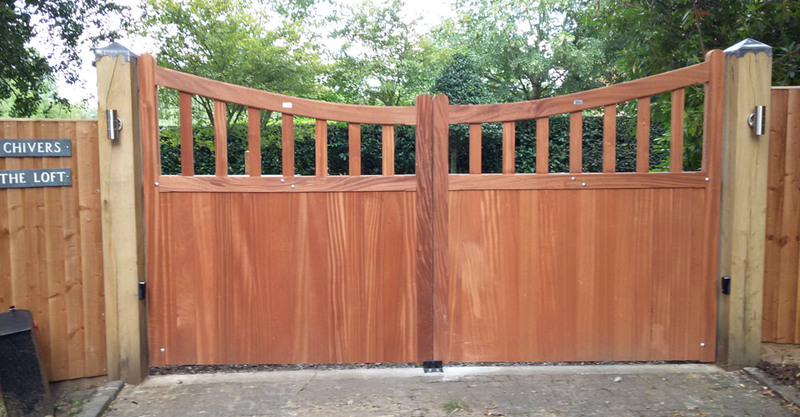 This gate bows – upward, starting lower at the shoulders and rising into the middle. 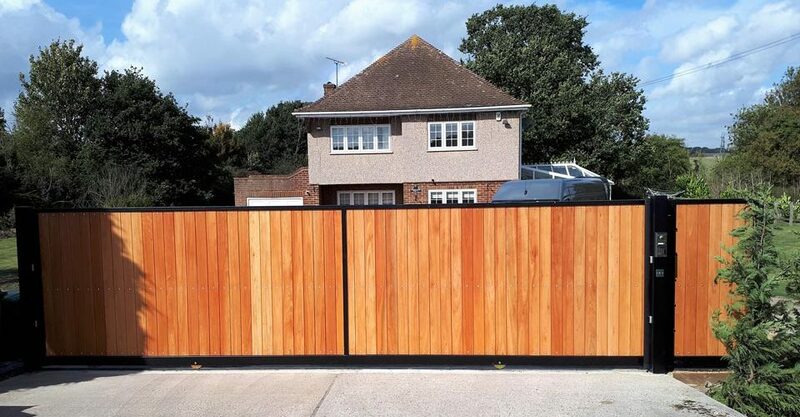 The Morden Ayot once again has accurate spacing between the cladding and is a modern-day twist on some of the more traditional styles. 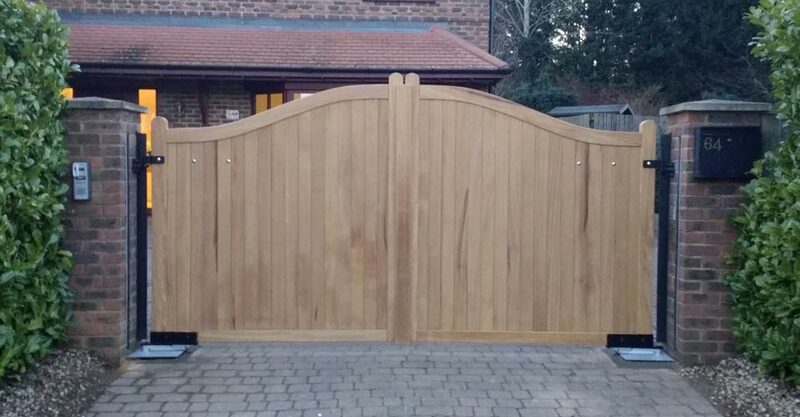 It is concave – dipping down in the middle – making this an attractive solution for your drive. 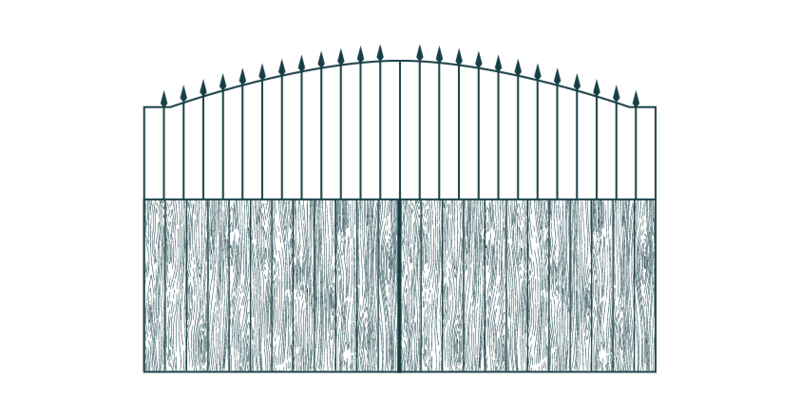 Fleur de Lis may be added to give a little more detail to complement the design. 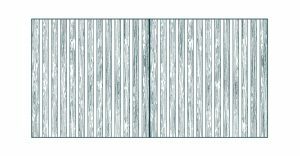 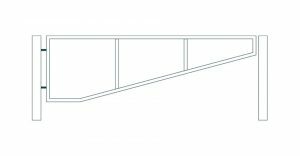 The Morden Sandy has accurate horizontal spacing between the cladding. 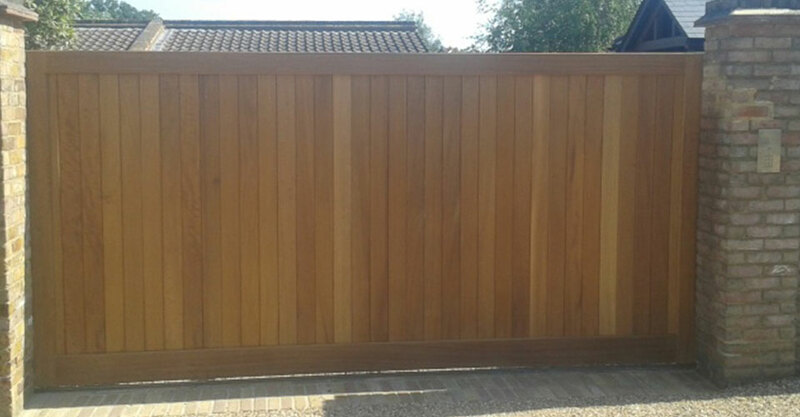 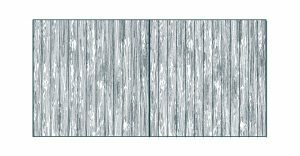 The horizontal cladding is an attractive alternative to the more traditional vertical cladding. 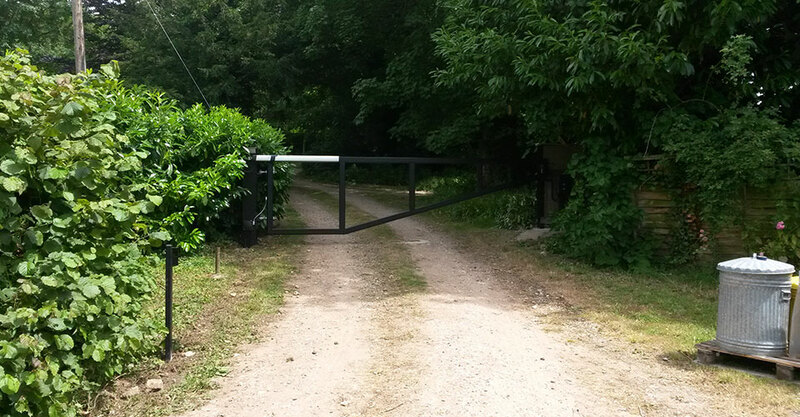 This stylish gate has a straight-top. 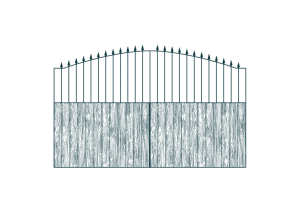 Gives the owner the ability to see out from the property through the metal pales sitting on top of the bottom half of the gate, which is fully boarded. 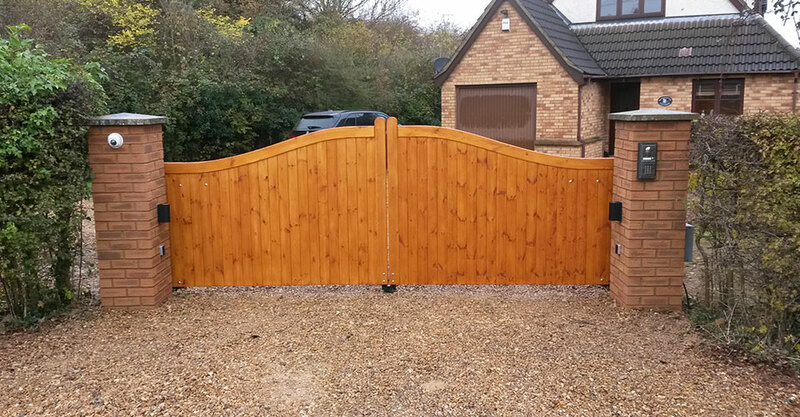 Prevents pets from being disturbed by passers-by as they cannot be seen. 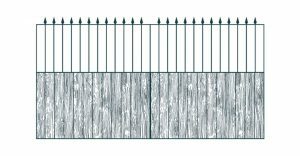 Fleur de Lis can be added to the top of the metal bars to complete the design. 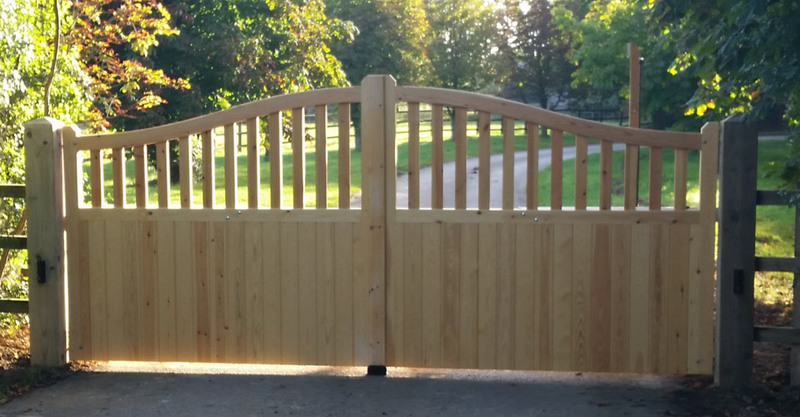 Rising from the shoulders to a greater height in the middle of the gate – making for an upward arch appearance. 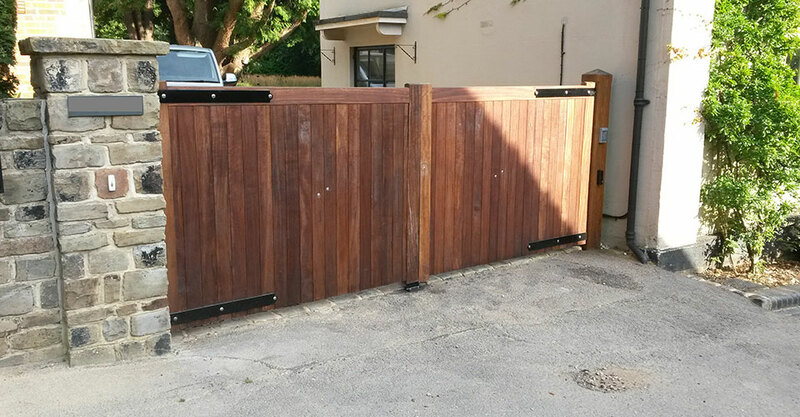 Half boarded gate complemented by equally spaced metal pales in the top half to allow visibility from within and outside of the property. 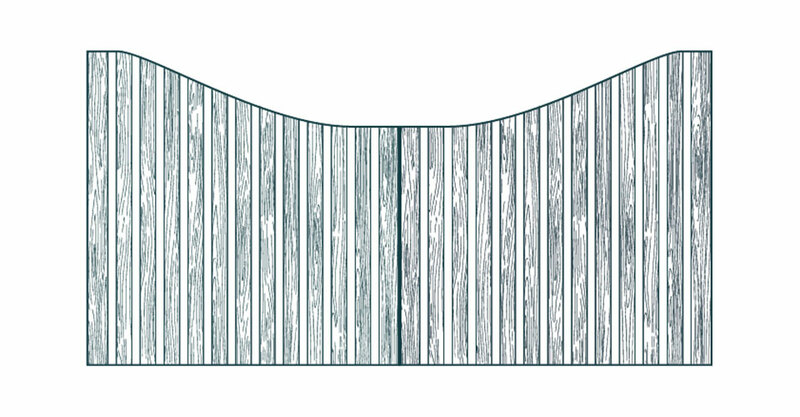 The top of the Wimpole gate dips down toward the centre, giving a bowed appearance. 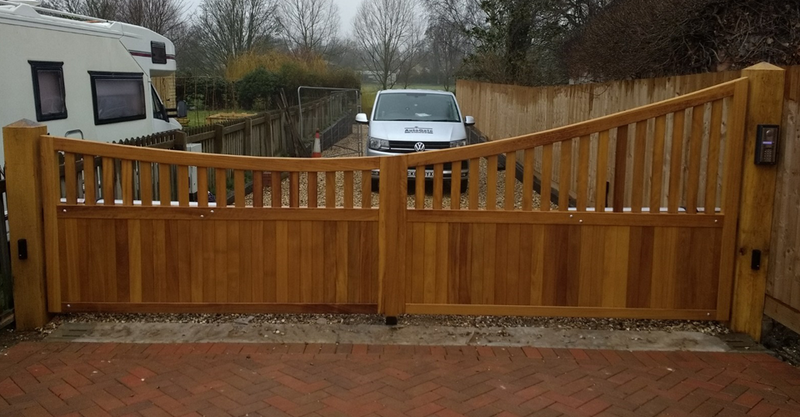 Bringing a sense of natural beauty to any drive, our timber gate range offers impressive designs to create a striking impact at the exterior of your home, enhancing the hard landscaping. 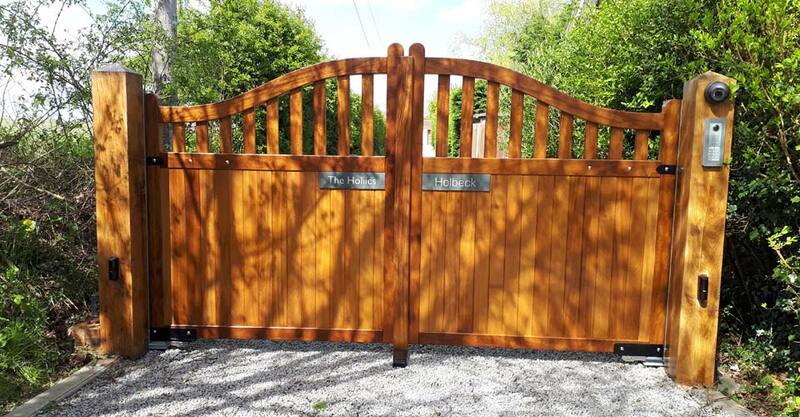 Available in a variety of softwoods and hardwoods, which can be oiled or stained; wooden gates make for a significant yet timeless statement at your driveway entrance that with a little tlc over the years, will prove to be a viable choice. 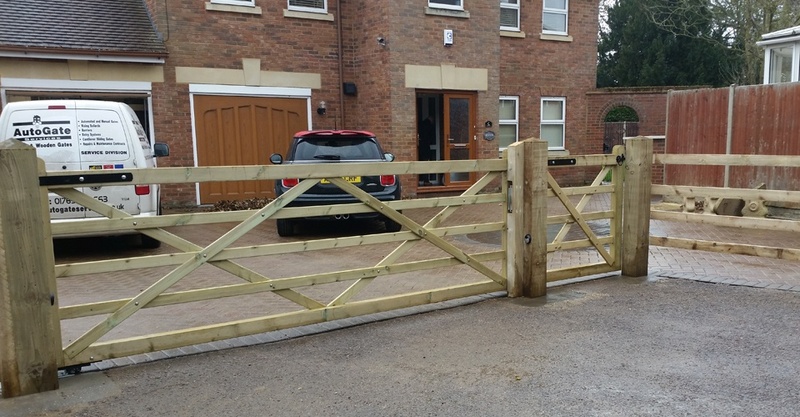 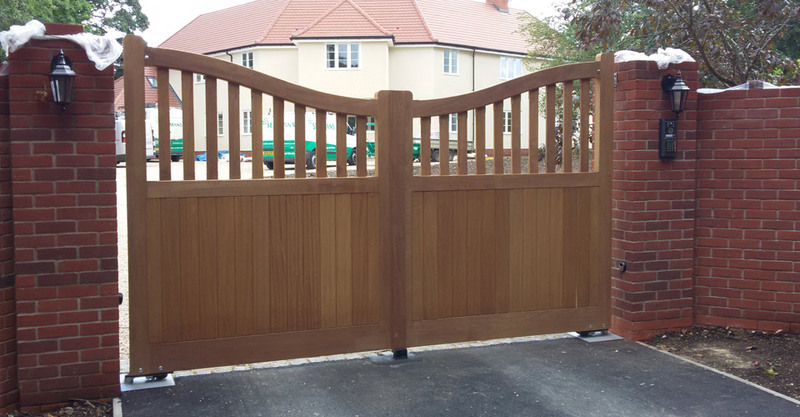 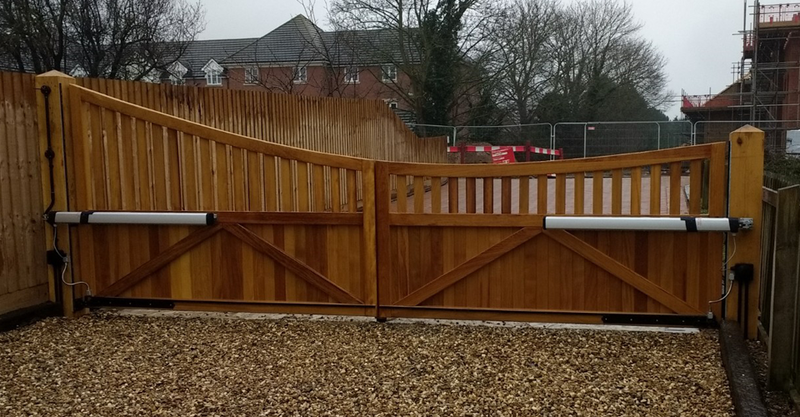 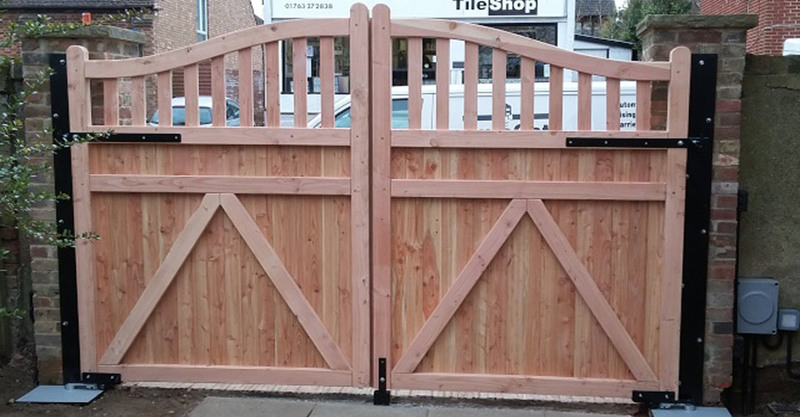 All of our wooden gate range can be made with a matching style pedestrian gate when you have a separate pathway, or need to allow for people on foot getting to your front door. 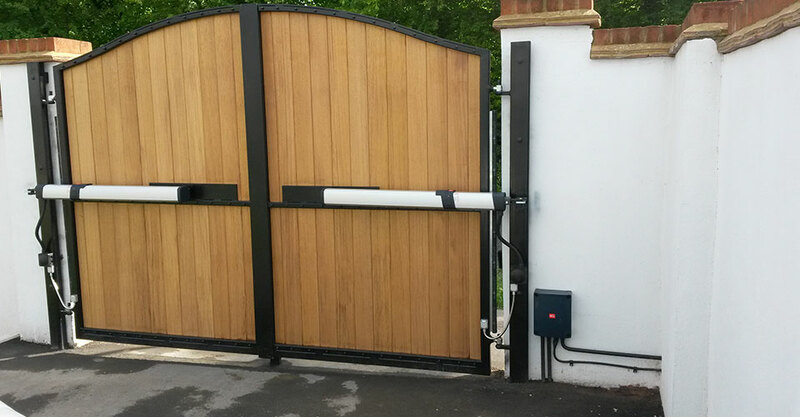 All styles can also be made as a sliding gate simply by bolting two leaves together, and adding a motor panel extension to one end. 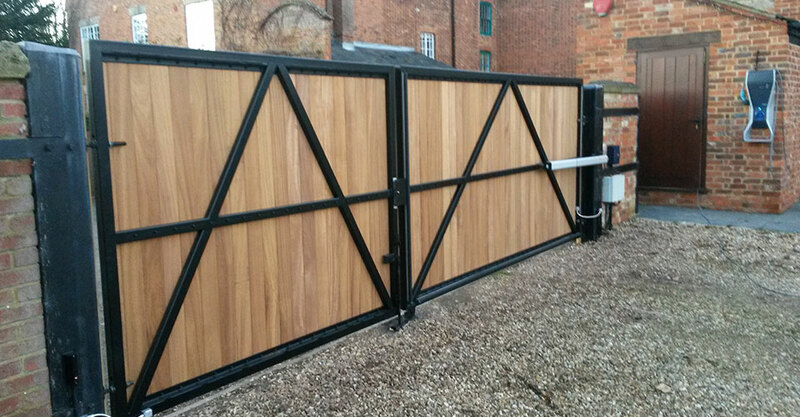 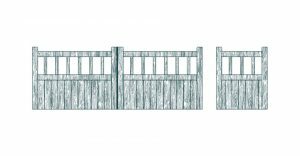 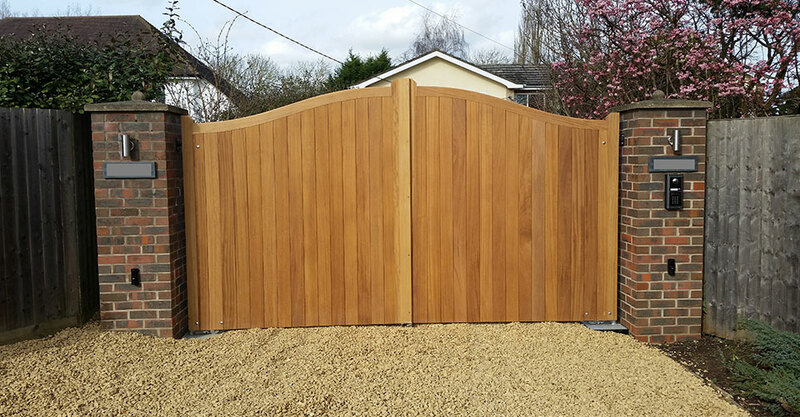 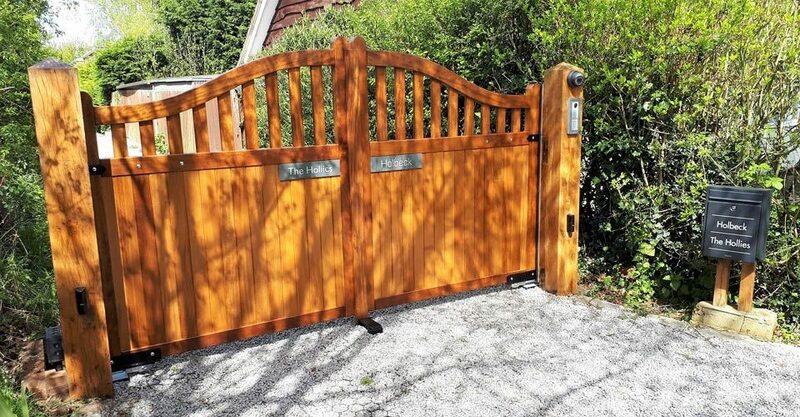 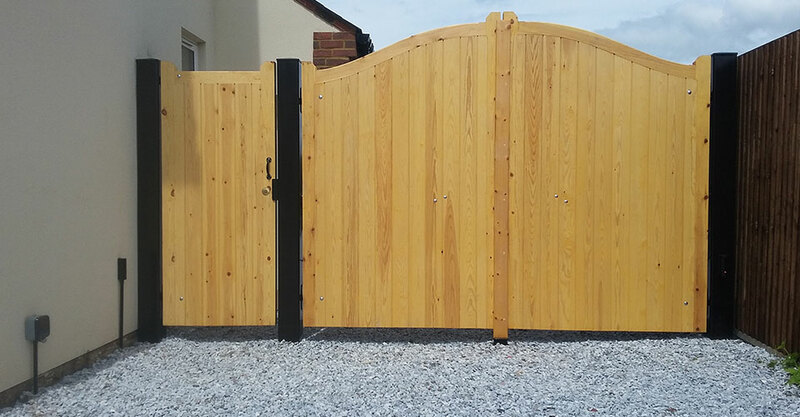 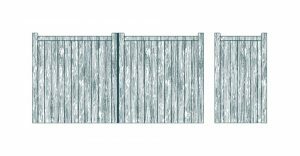 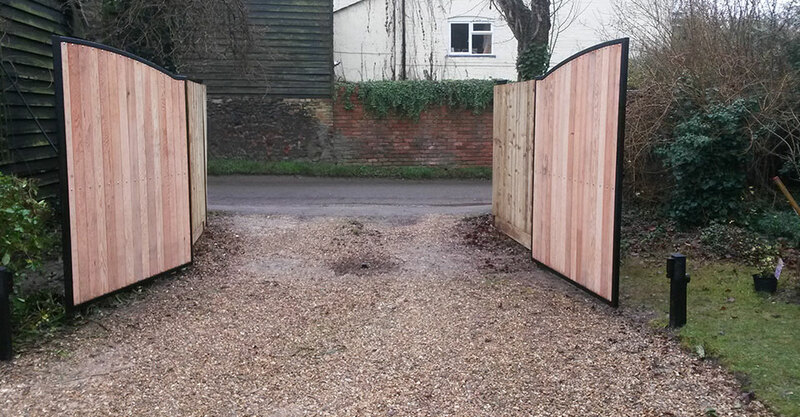 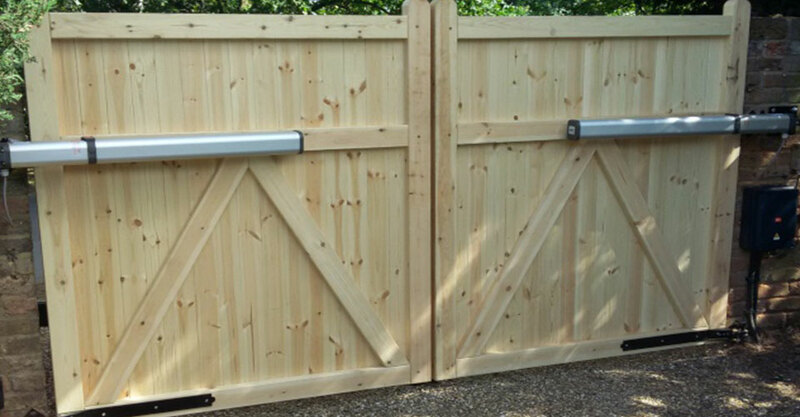 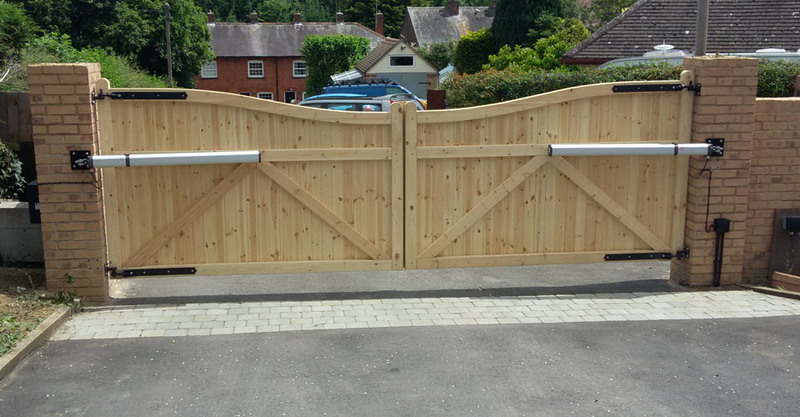 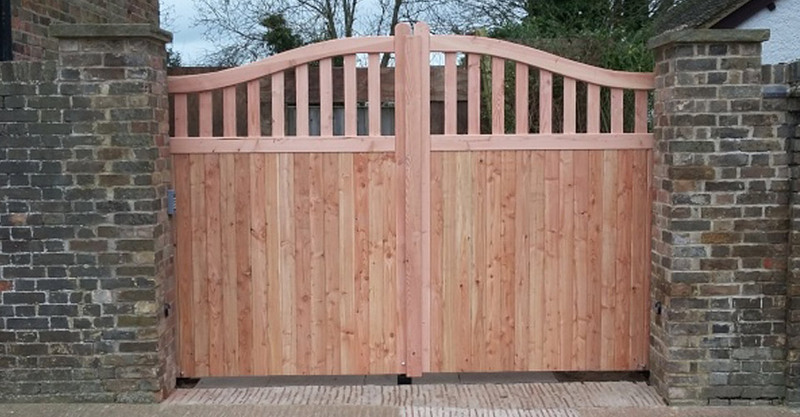 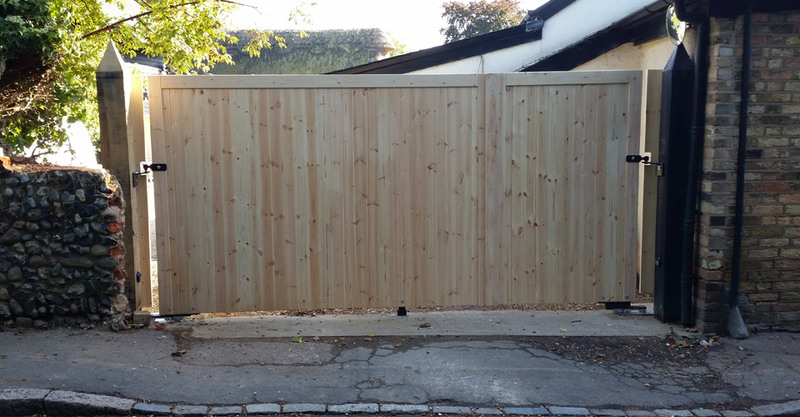 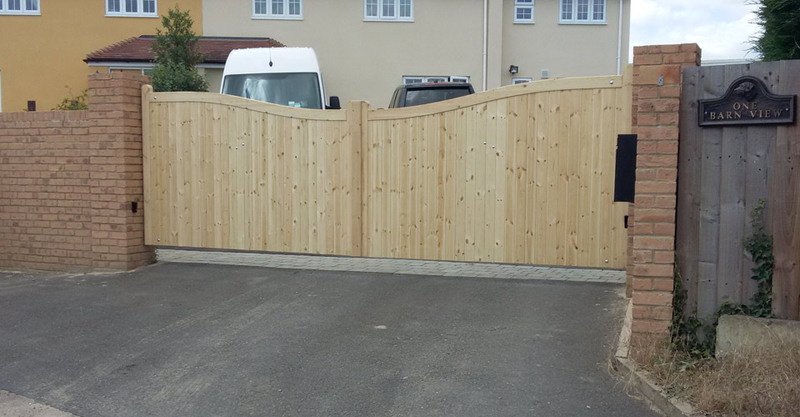 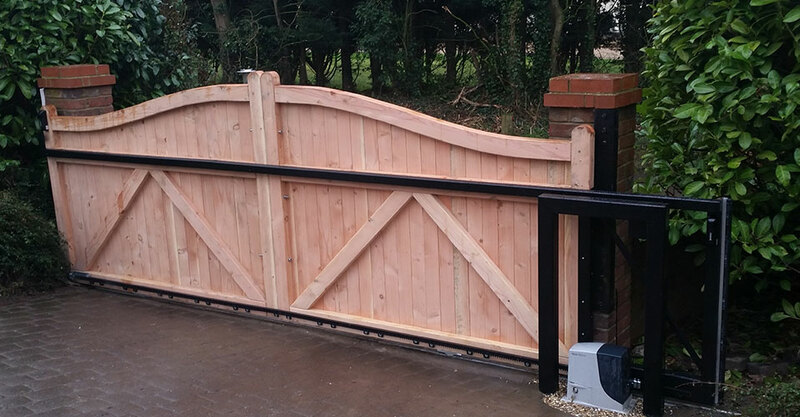 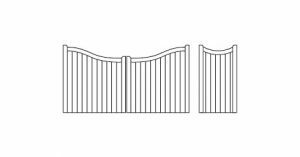 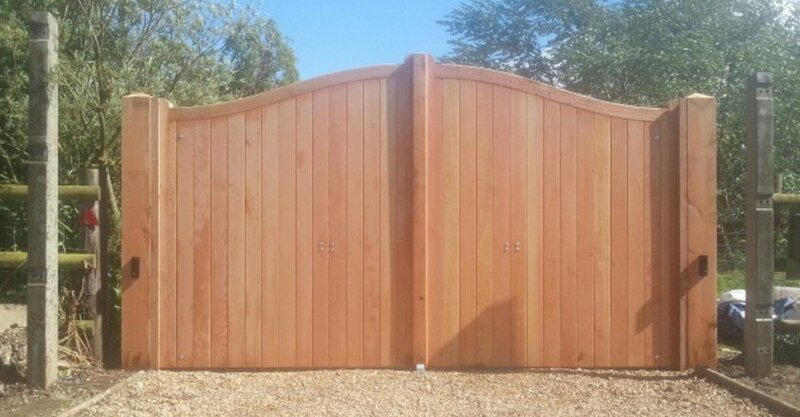 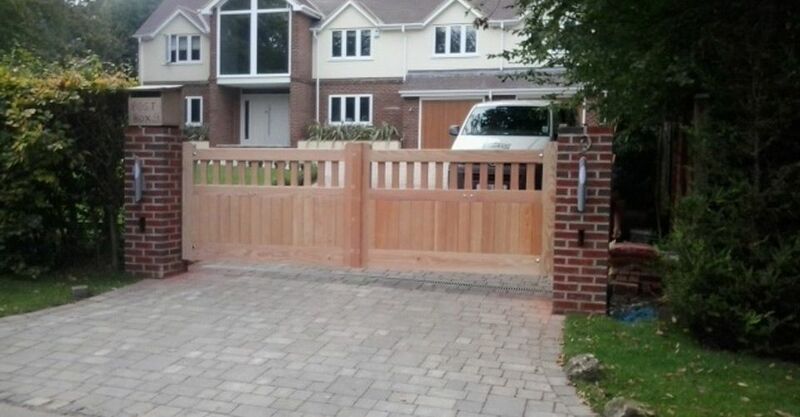 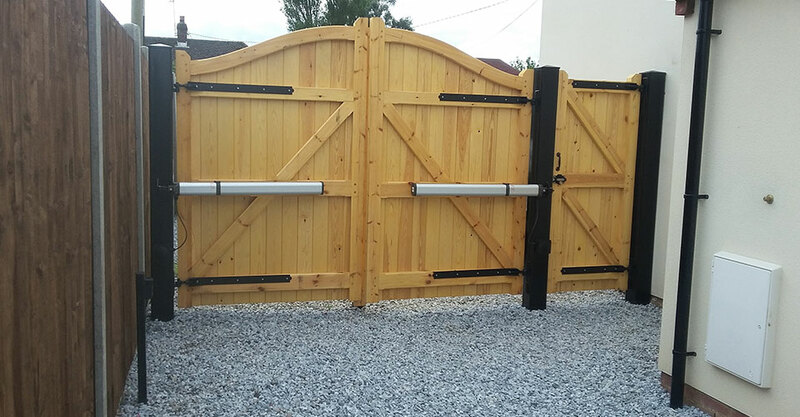 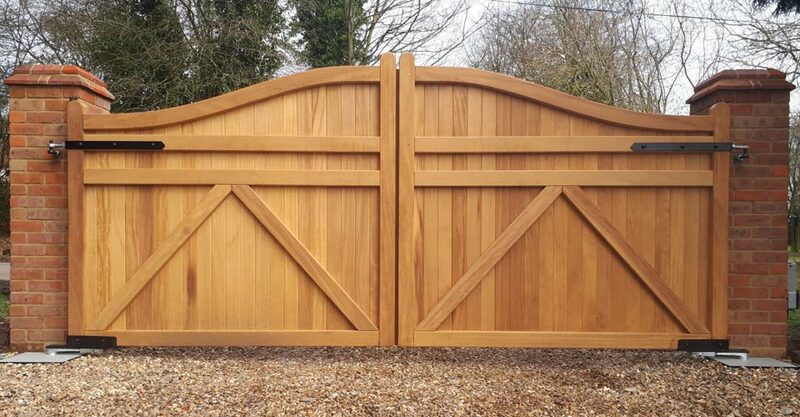 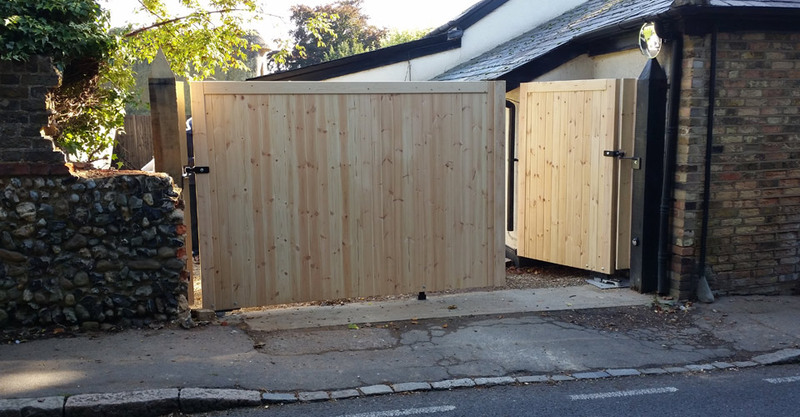 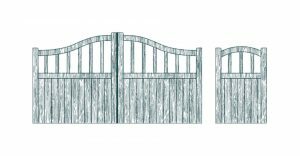 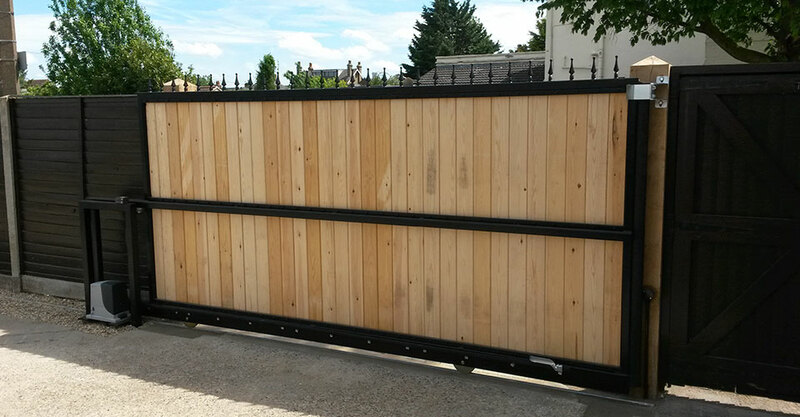 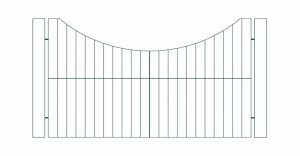 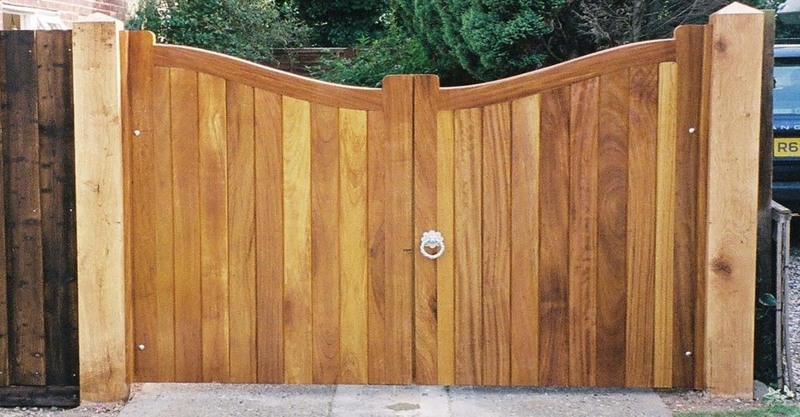 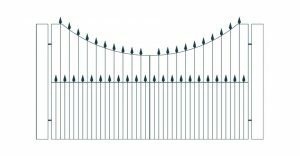 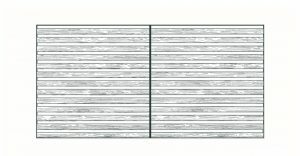 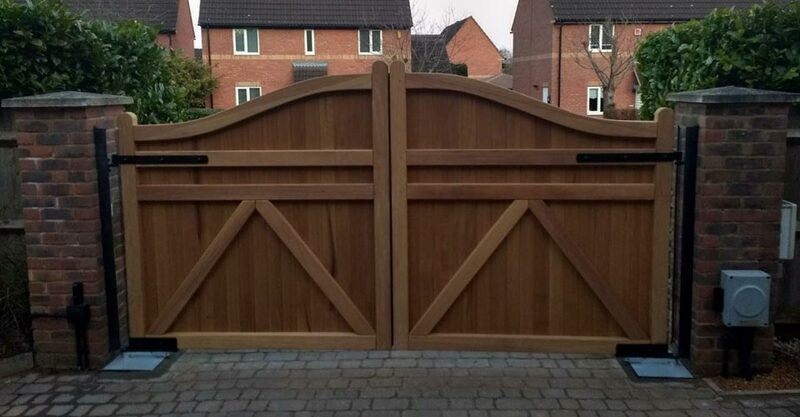 Maximum width for wood range gates is 4 metres as a pair and 4.5m as a sliding gate. 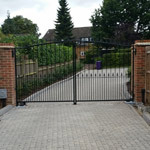 A practical and imposing proposition for enhanced security at your property. 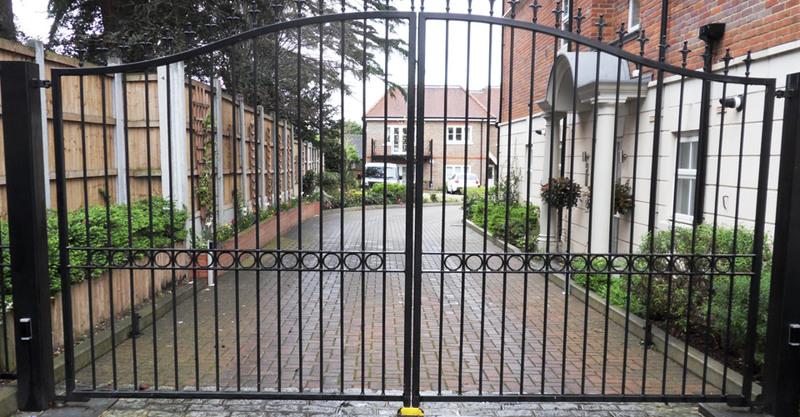 Total privacy – people cannot see into the property, and similarly you cannot see out. 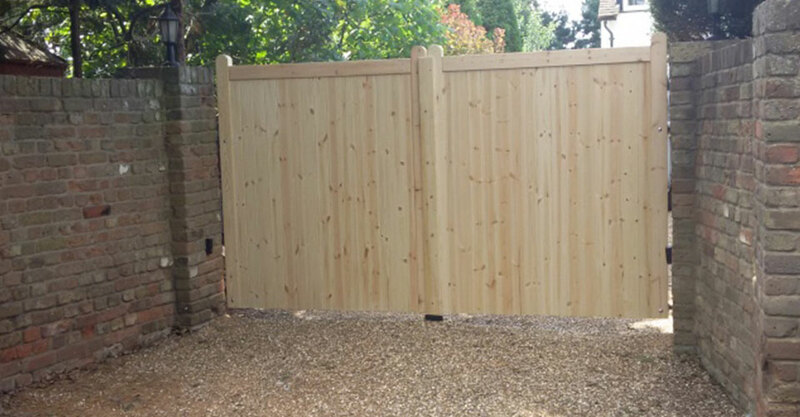 A full boarded 70mm frame wooden gate with a rising bow top. 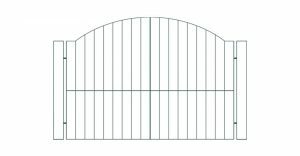 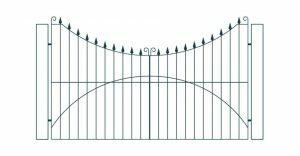 This gate starts lower at the shoulders and rises in the middle to create an upward bow effect. 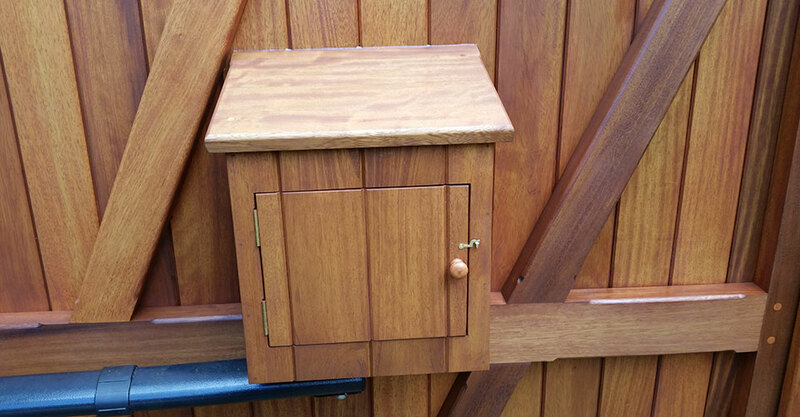 Full close- boarded for total privacy. 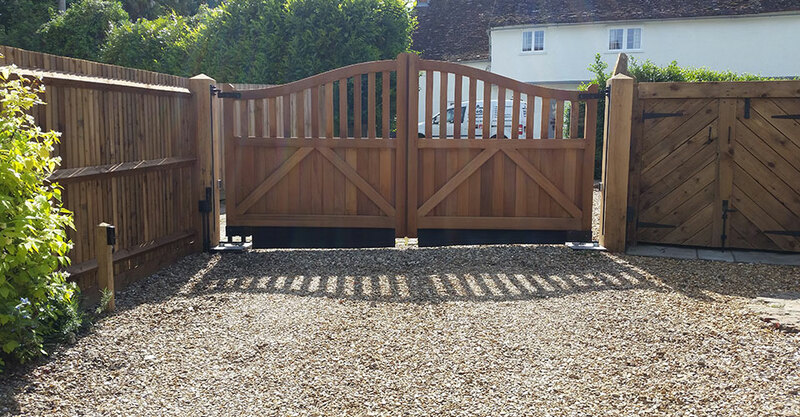 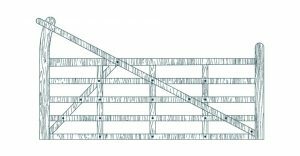 The Meldreth 70mm frame full boarded gate is the reverse of the Kelshall, being higher at the shoulders, and bowing down in the middle. 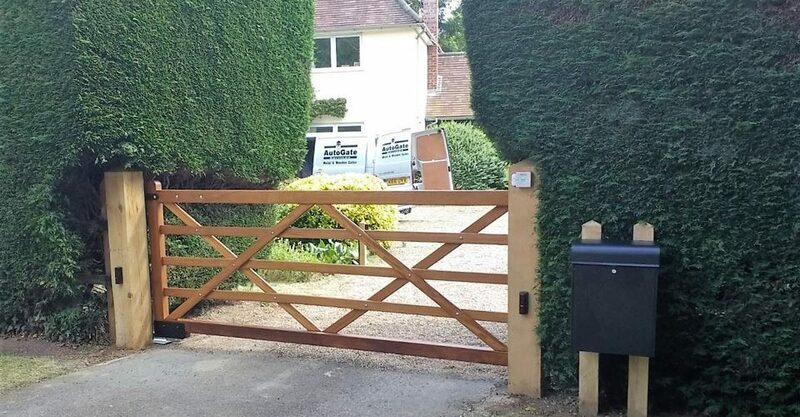 Full close- boarded once again, offering total privacy. 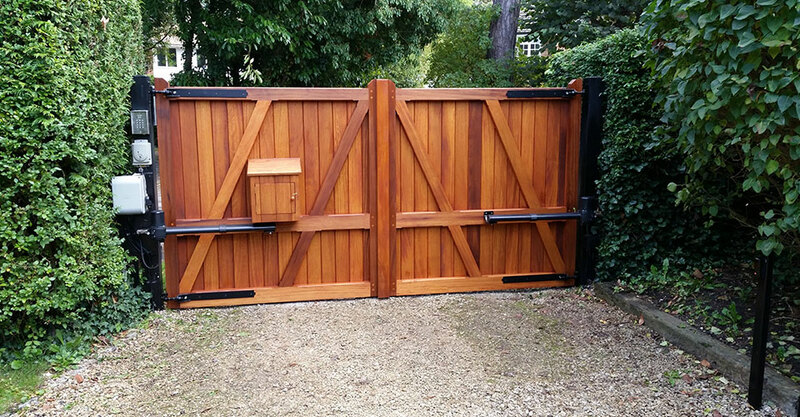 Stylish half close-boarded gate with equally spaced wooden pales, straight top design. 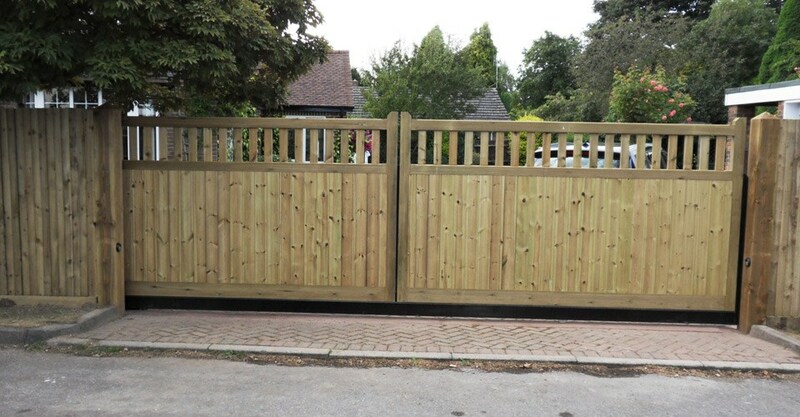 Promotes visibility both into and out from the property. 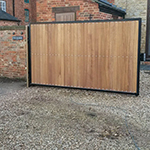 Half boarded gate complemented by equally spaced wooden pales in the top half to allow visibility from within and outside of the property. 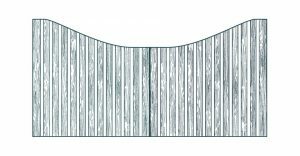 The top of the Radwell gate dips down toward the centre, giving an inverted bowed appearance. 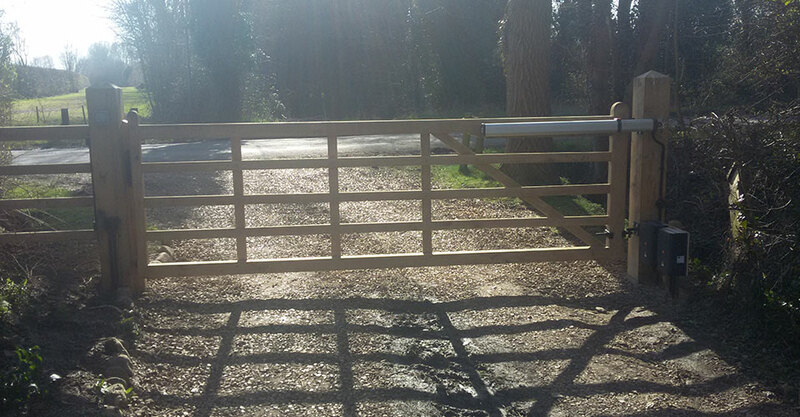 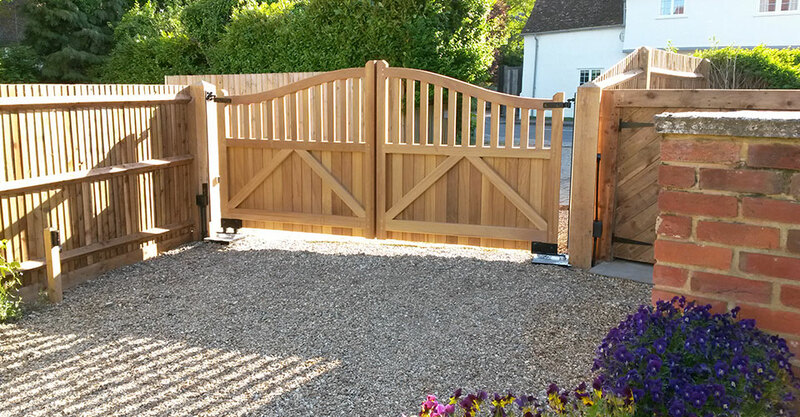 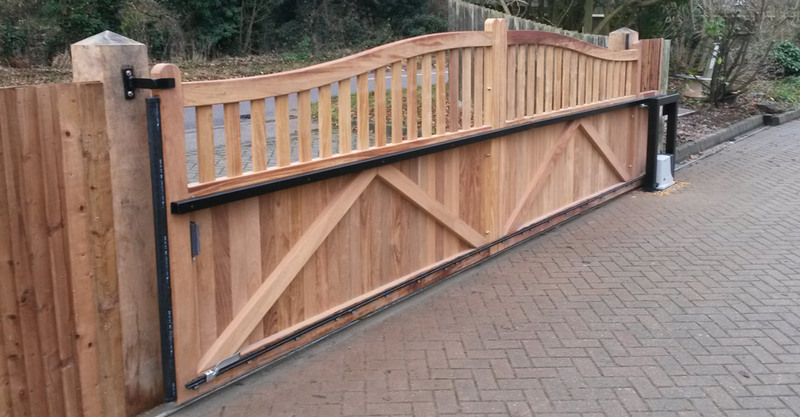 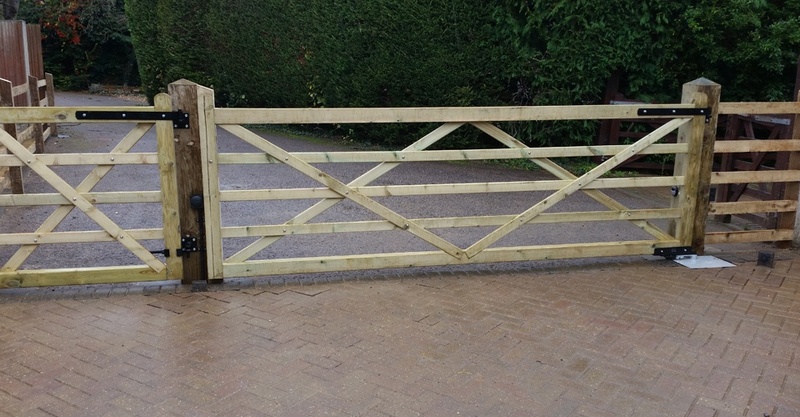 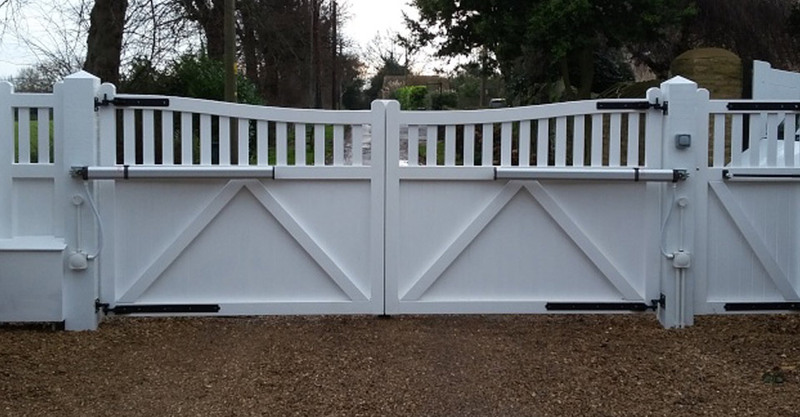 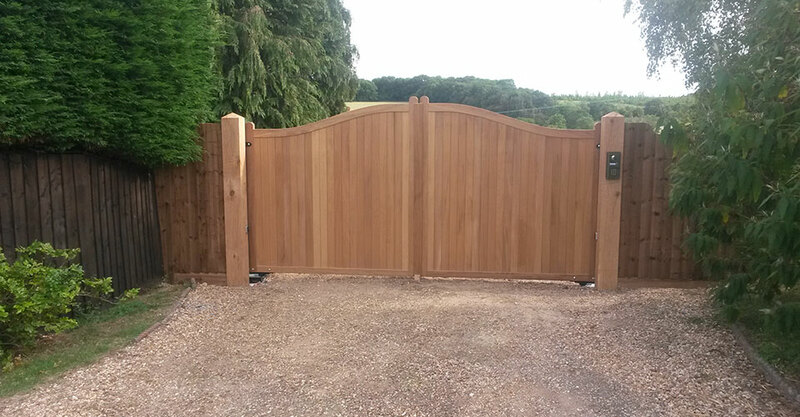 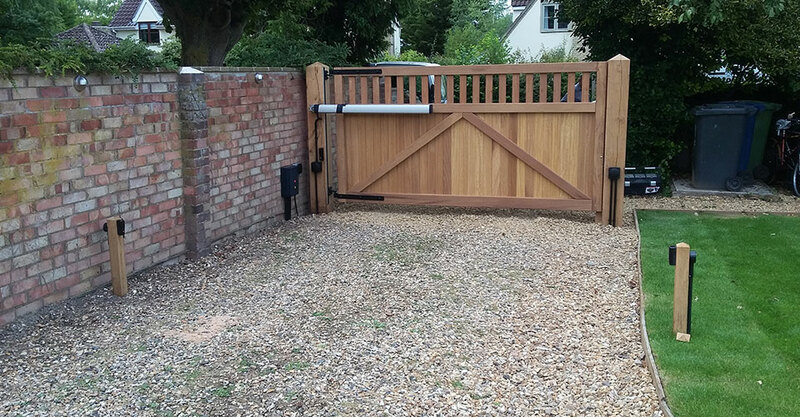 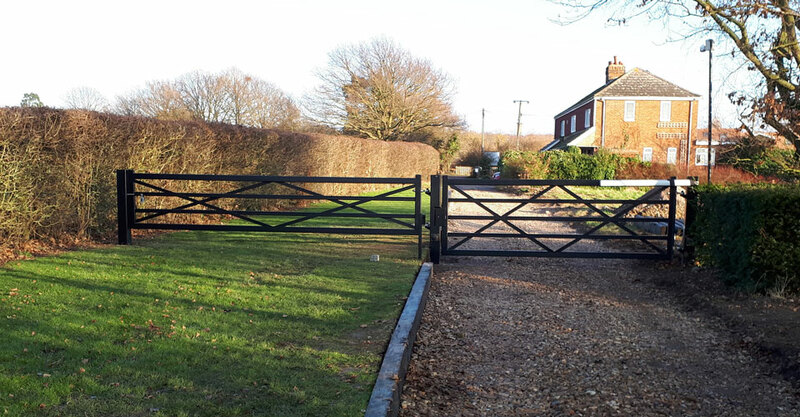 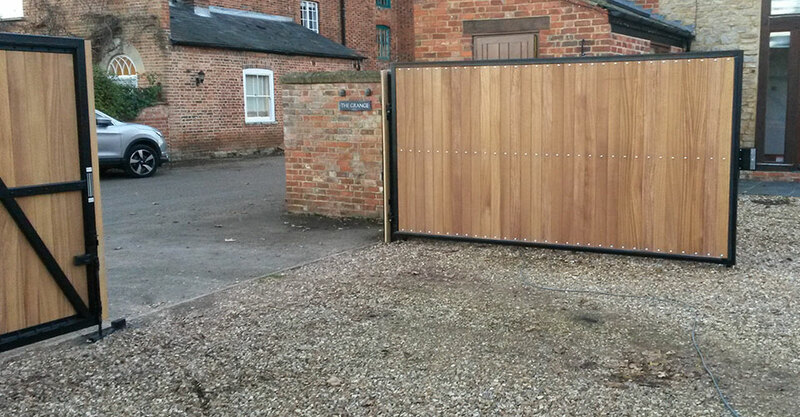 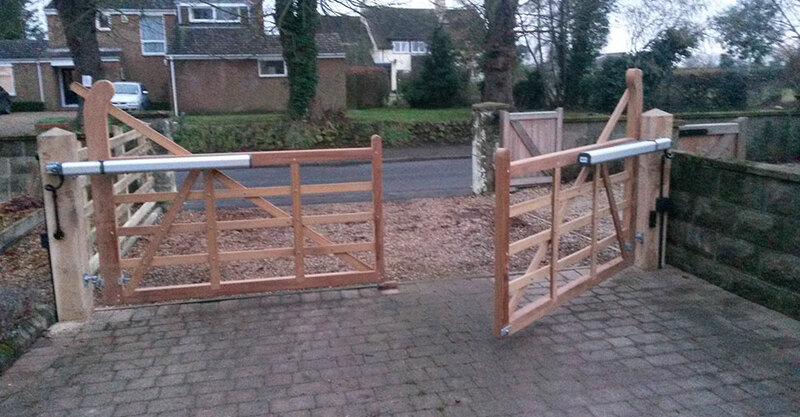 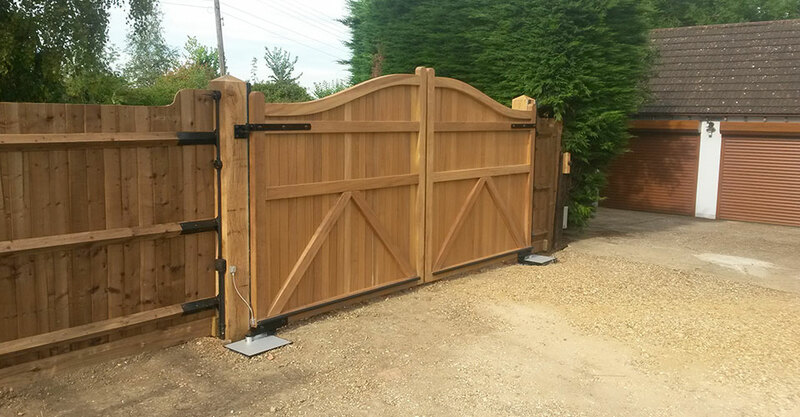 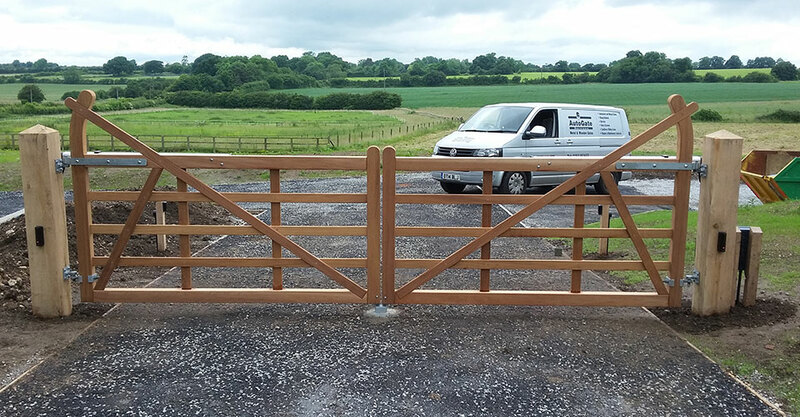 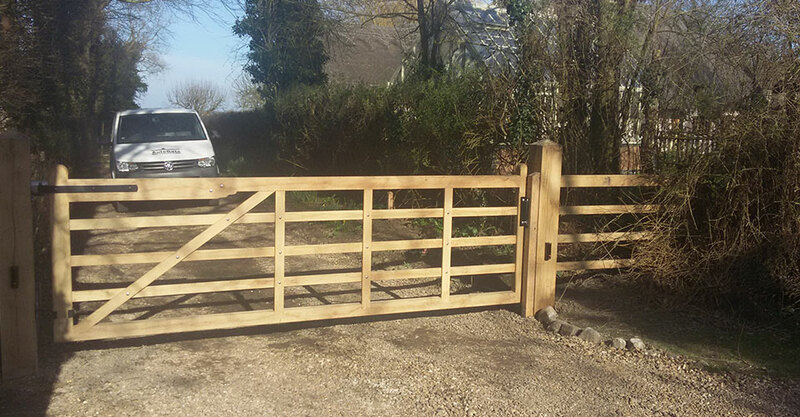 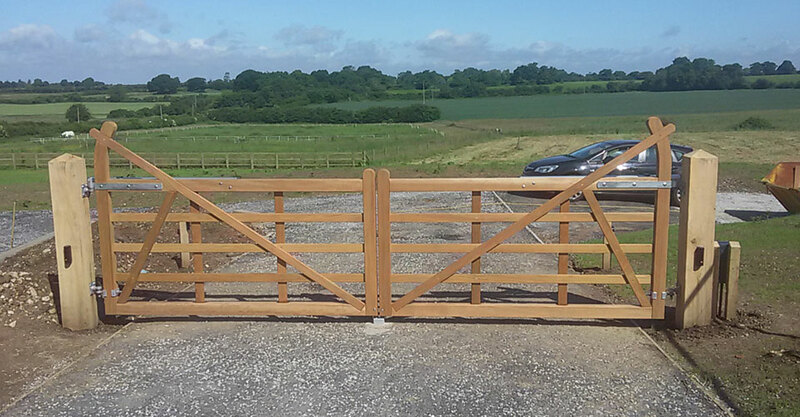 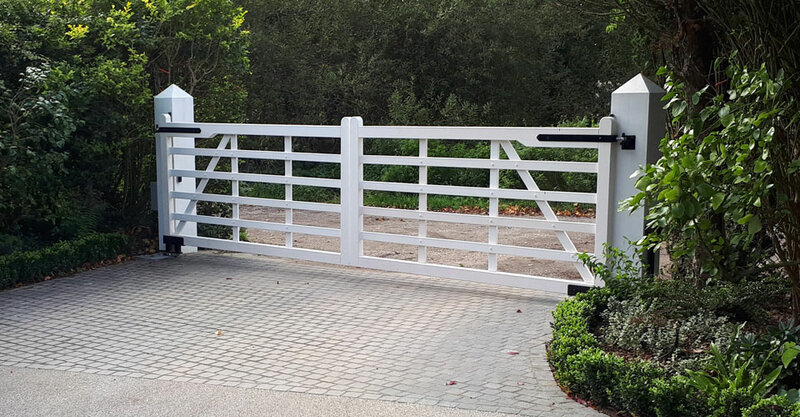 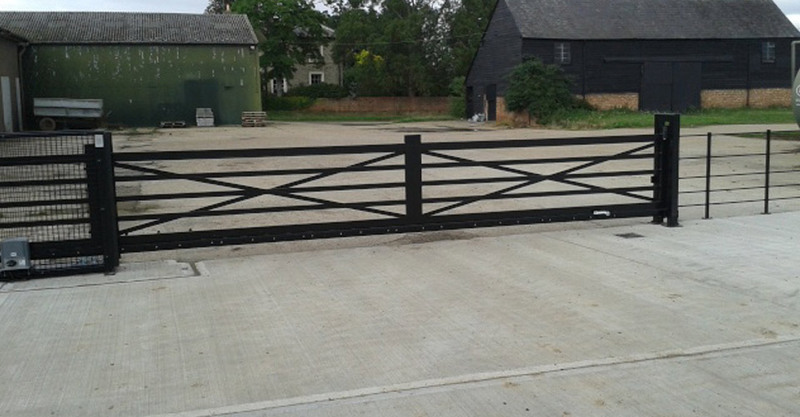 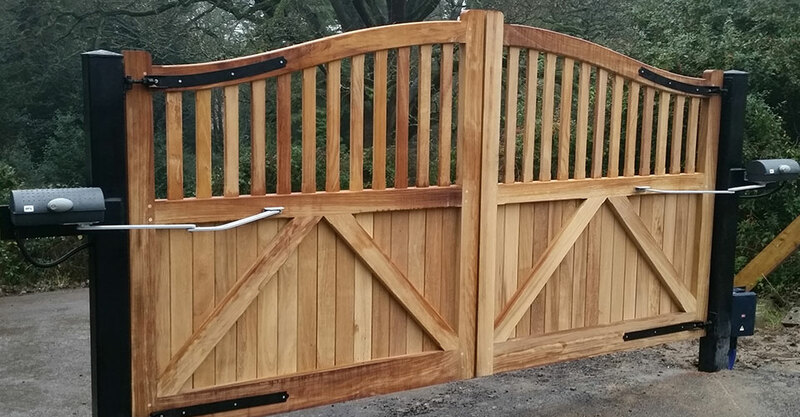 A traditional wooden 5-bar field gate, creating a country feel to any driveway. 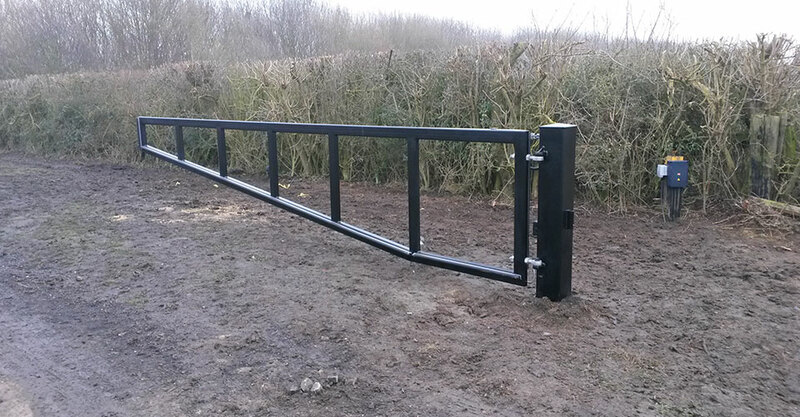 70mm sturdy frame with a diamond brace support. 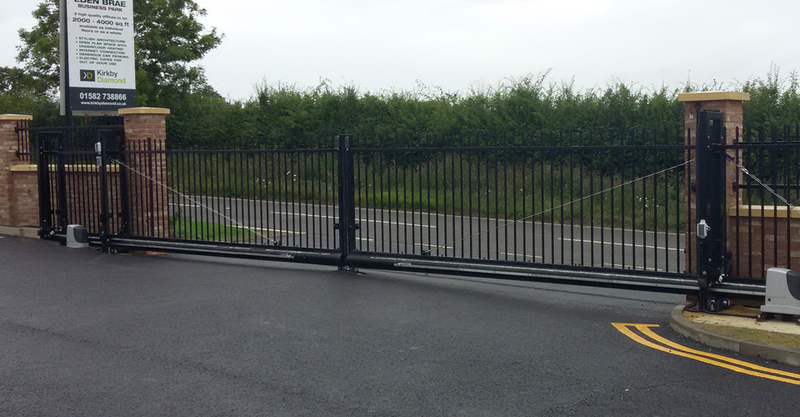 Bottom base rail to prevent twisting when gate is automated. 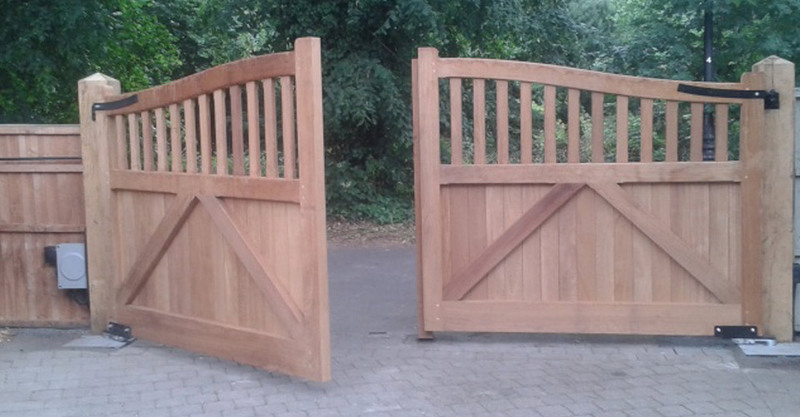 Can be made as a single leaf or a pair of gates. 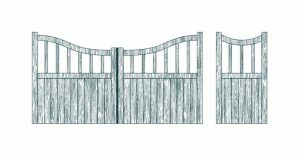 Similar in design of the Foxton, the Heydon gate has a raised helve at the hinged end of this traditional wooden 5-bar field gate. 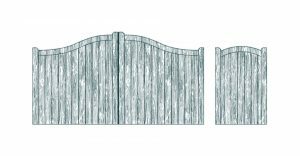 A stylish option if you prefer a country look, the Barrington is a functional, timeless classic and an alternative to the raised helve. 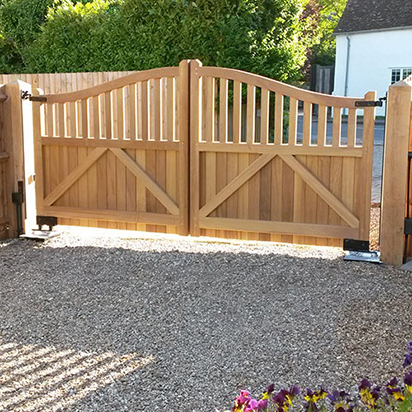 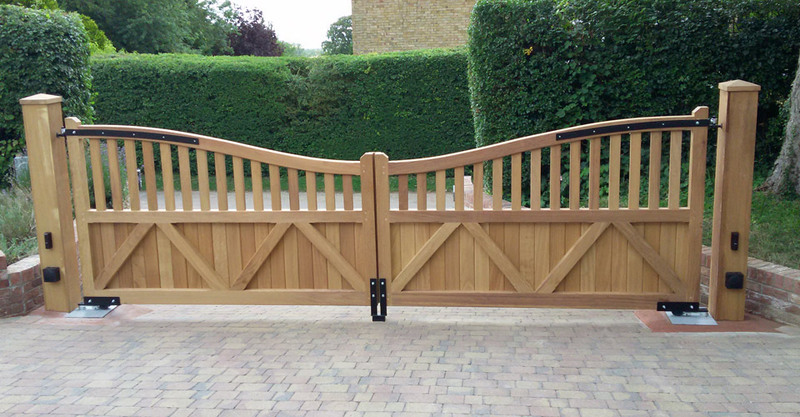 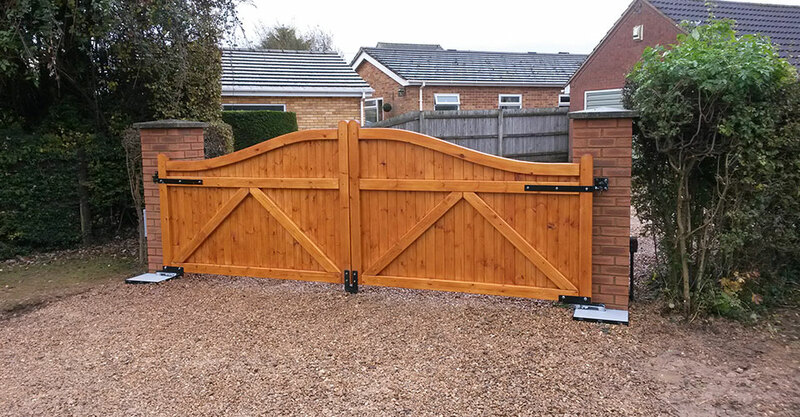 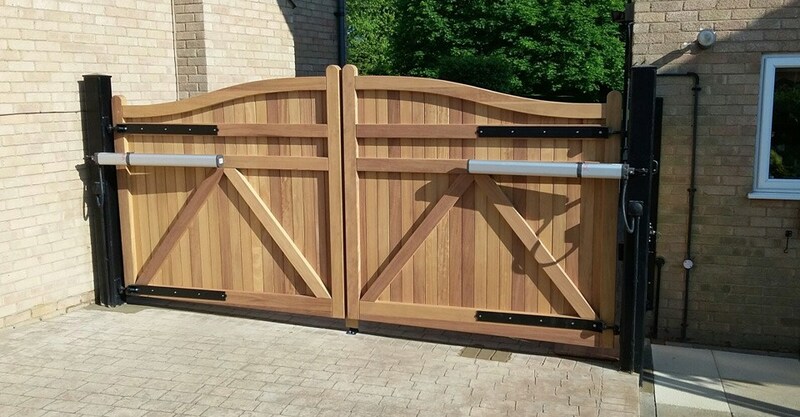 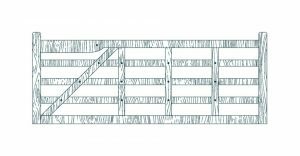 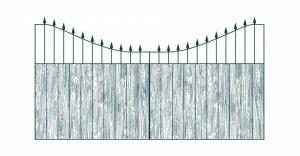 This traditional wooden 5-bar field gate with straight up-right supports – often referred to as ‘Shotgun Gates’. 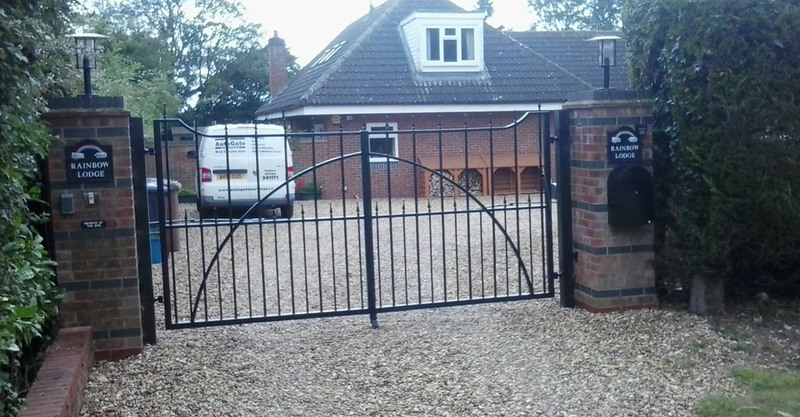 Can be made as a single leaf or a pair. 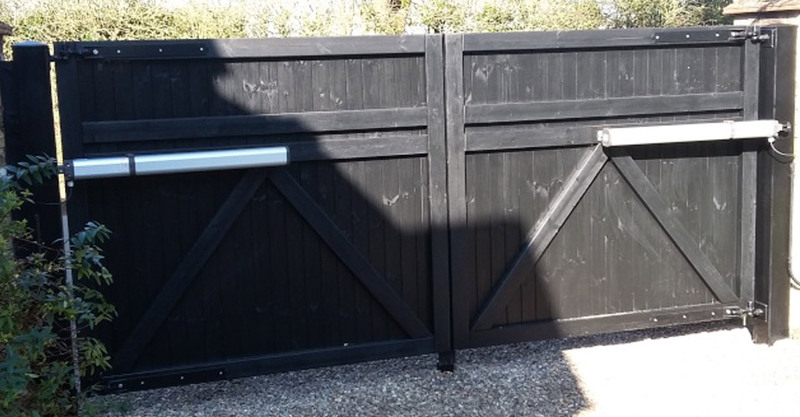 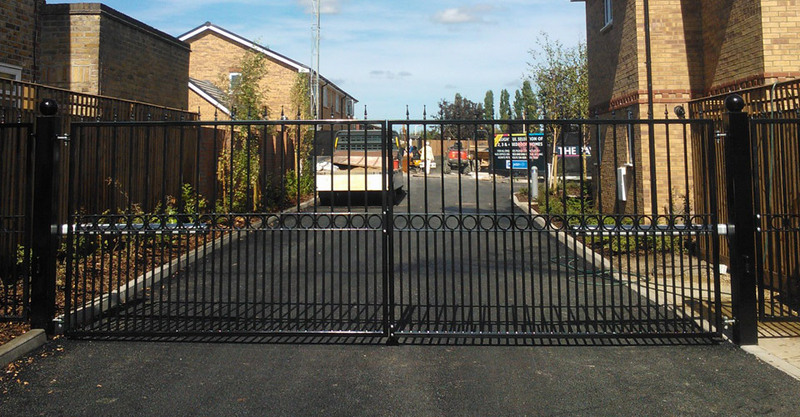 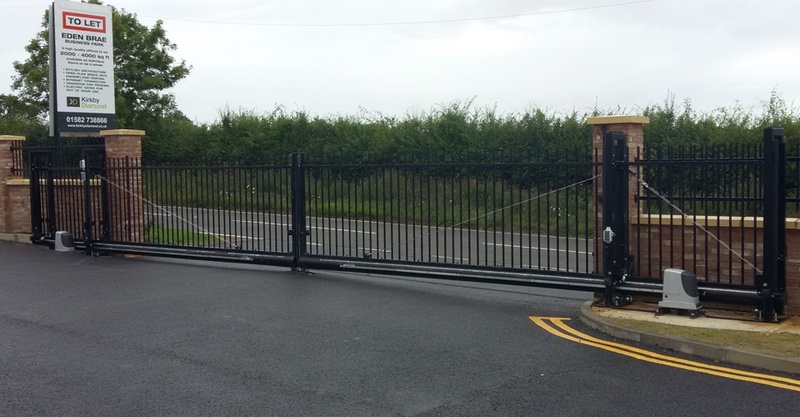 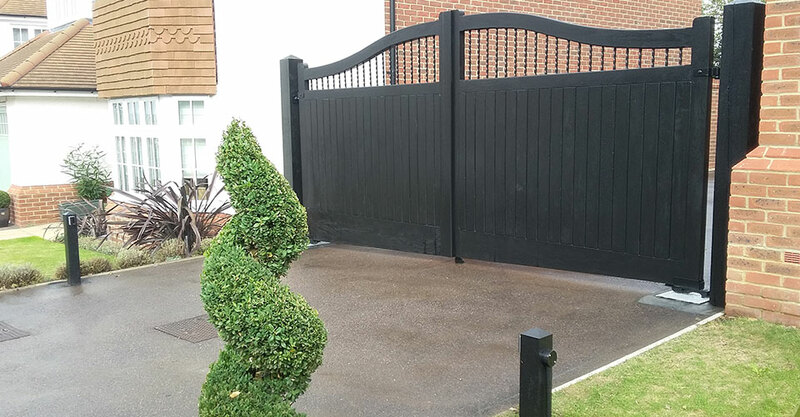 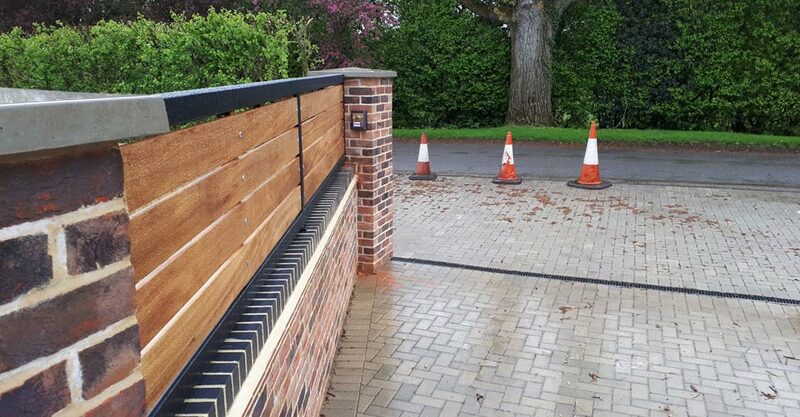 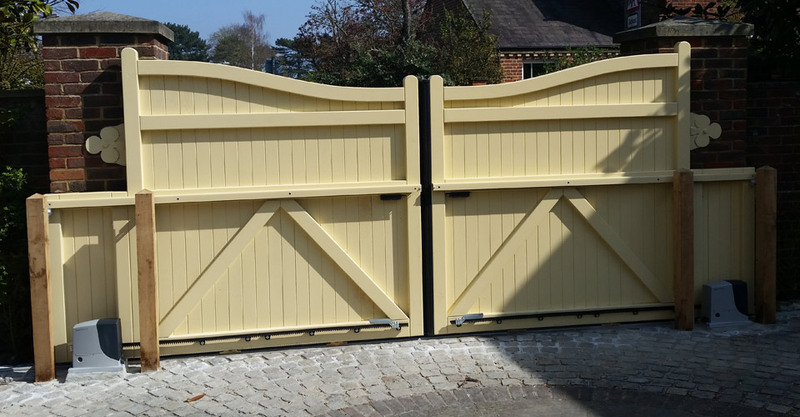 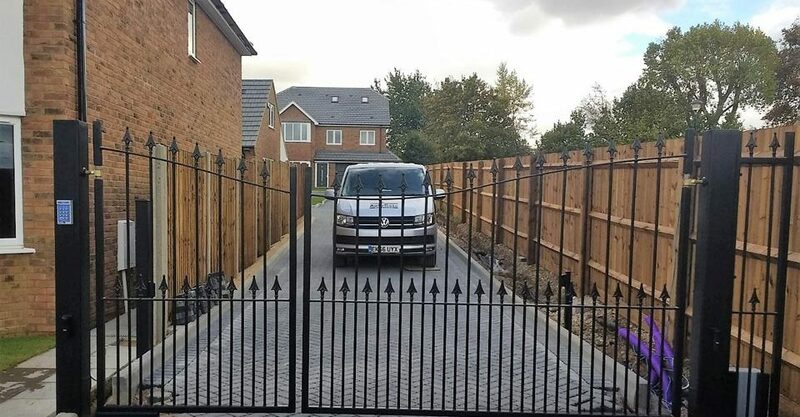 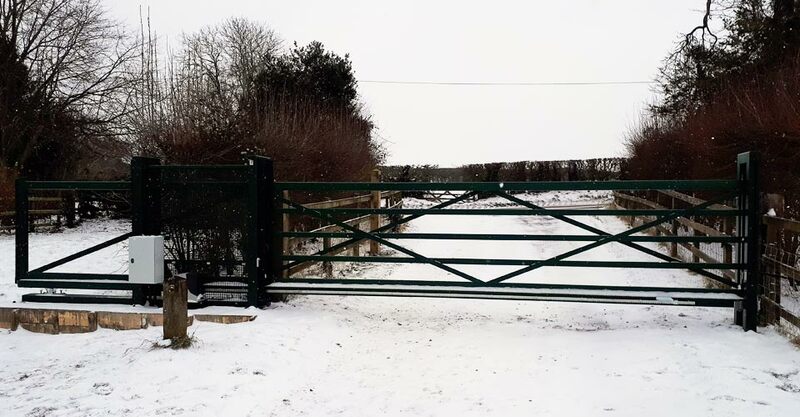 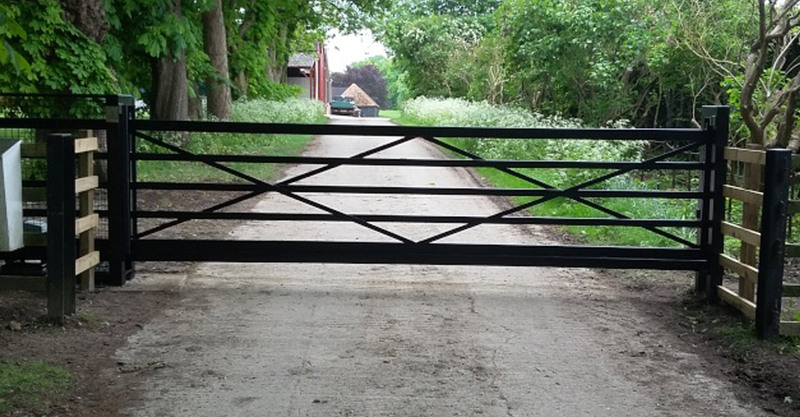 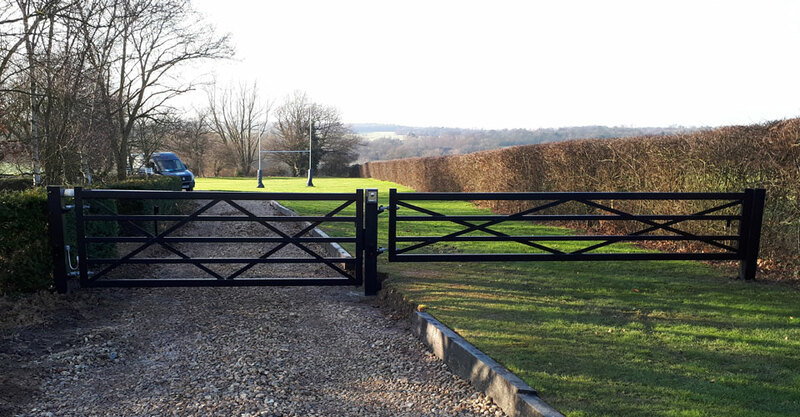 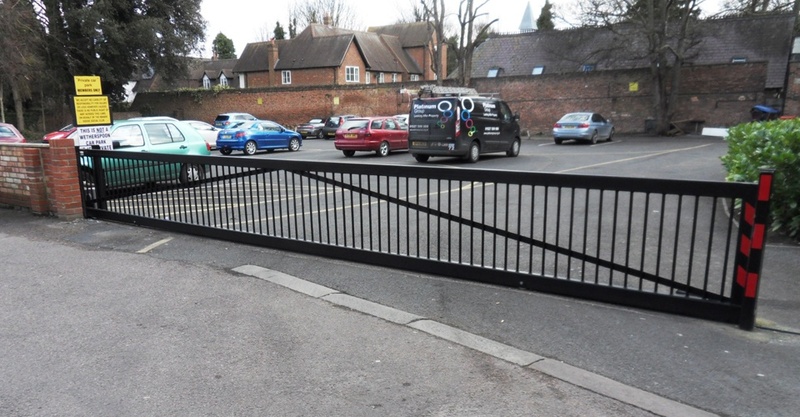 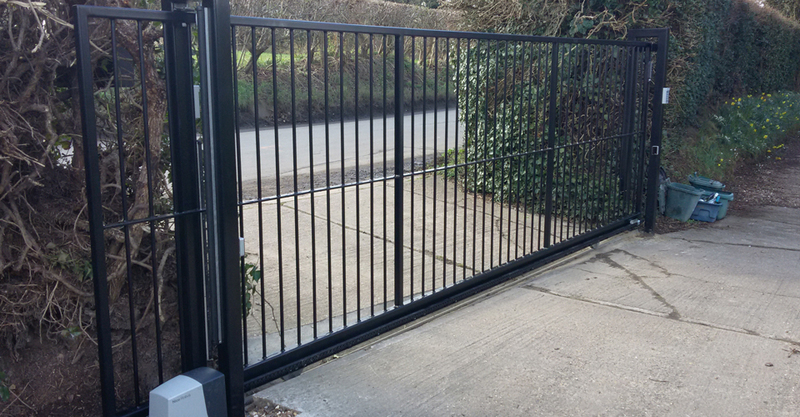 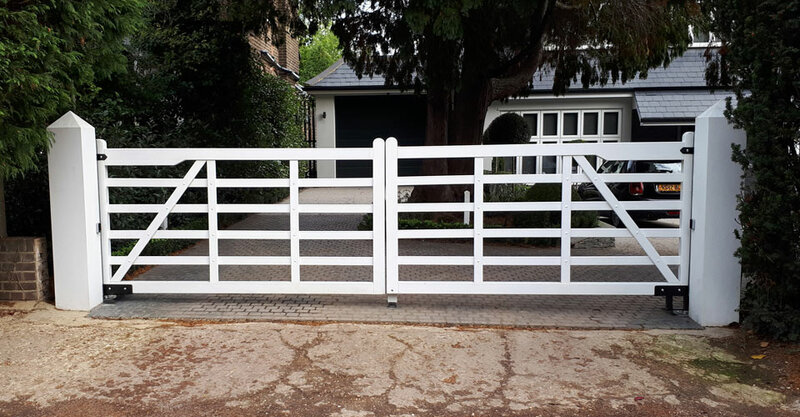 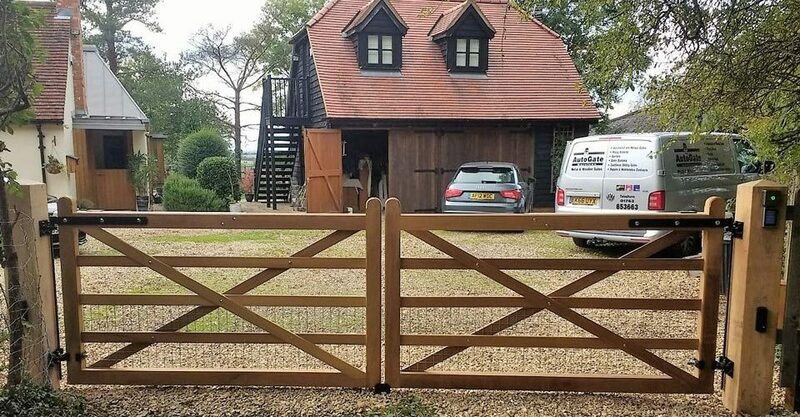 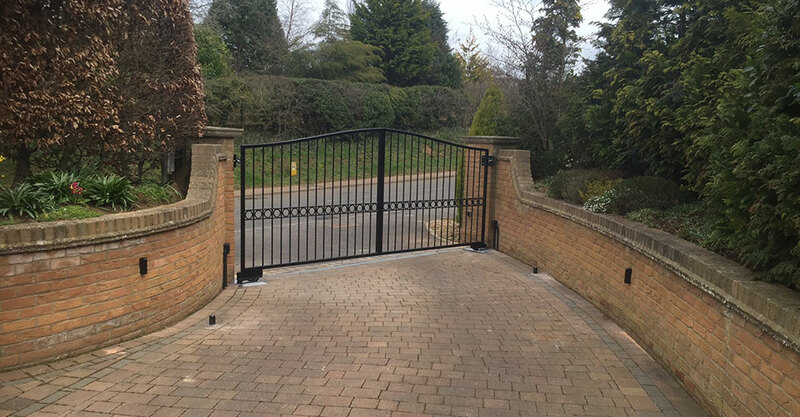 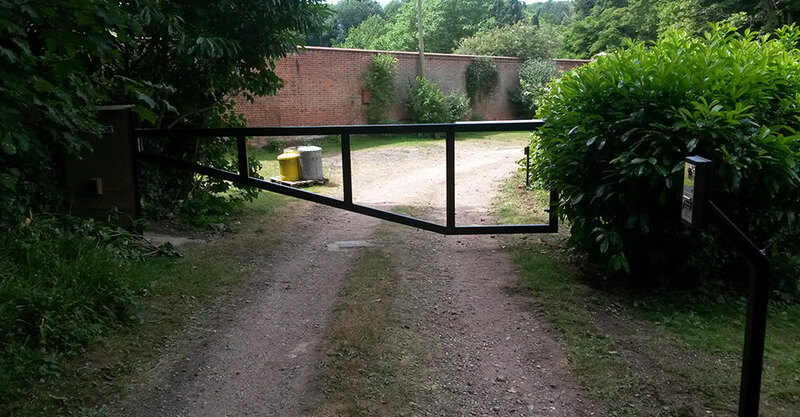 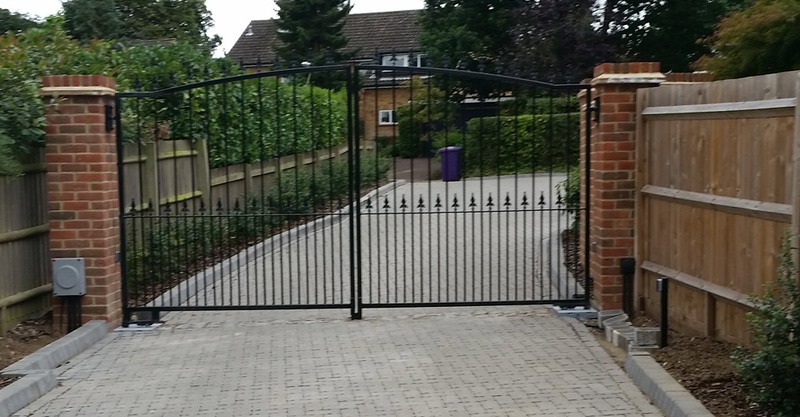 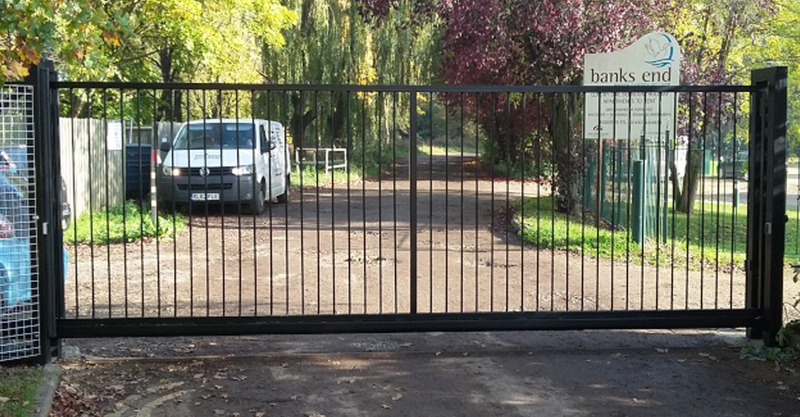 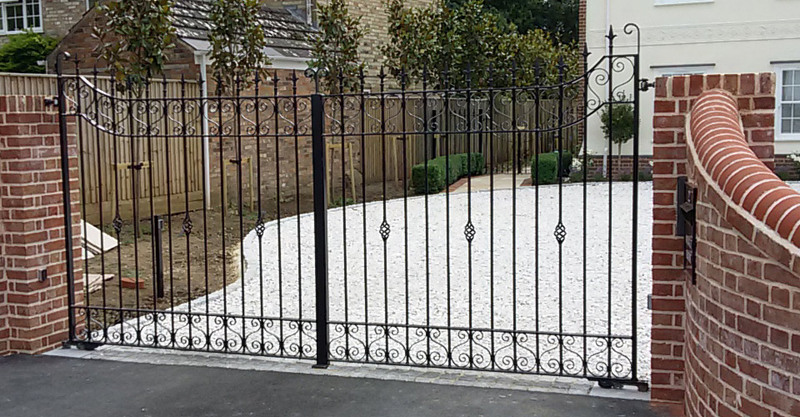 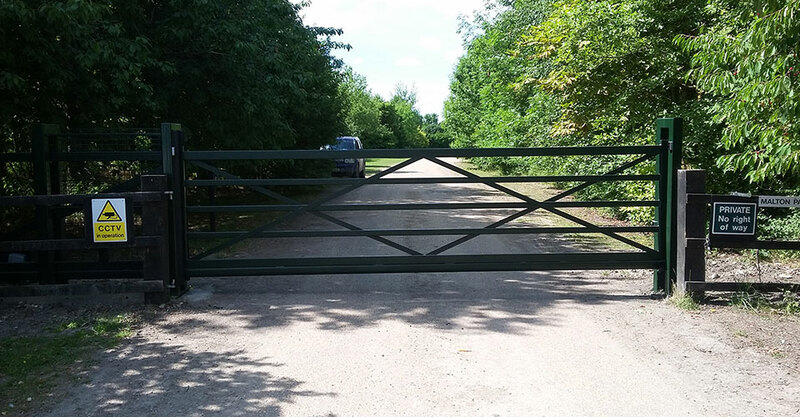 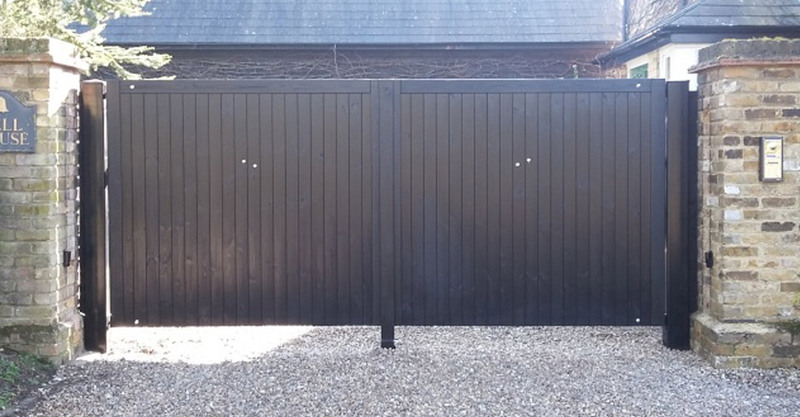 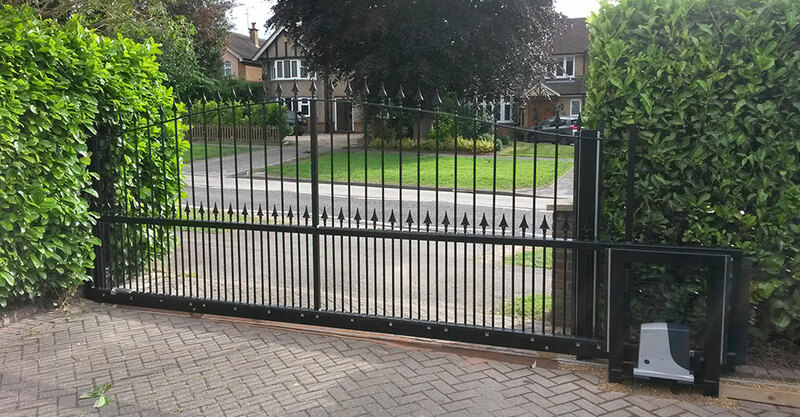 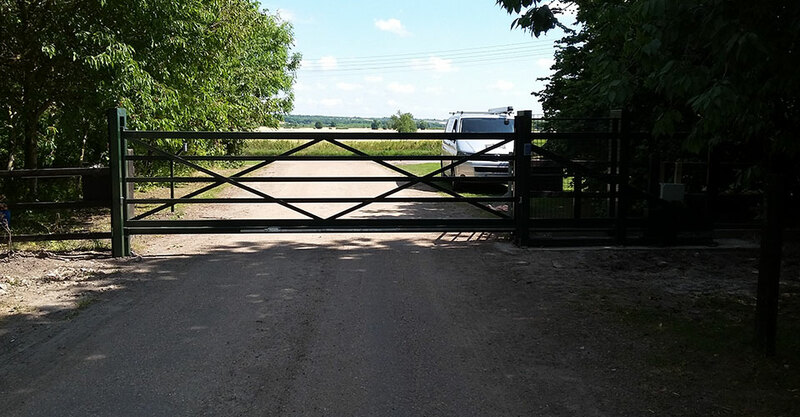 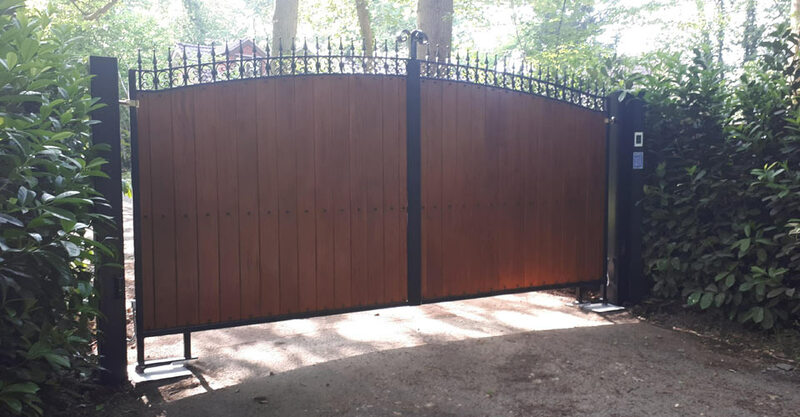 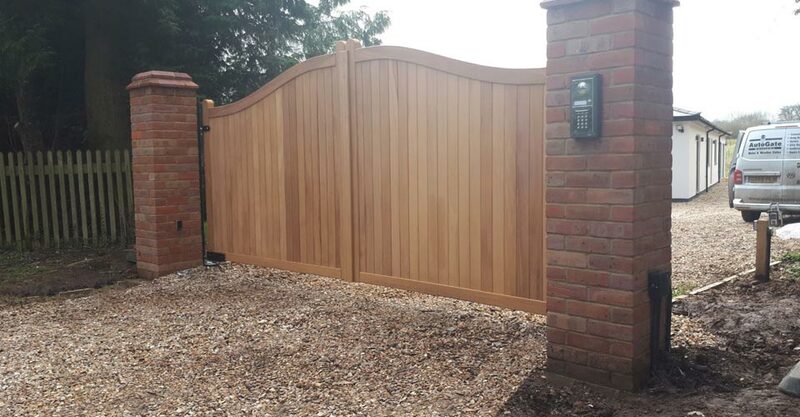 Manufacturing your metal gates at our very own Hertfordshire site means we have total control over the quality and design, allowing us to offer you a fully bespoke service, as well as a wide range of popular gate styles to fit your specific driveway size. 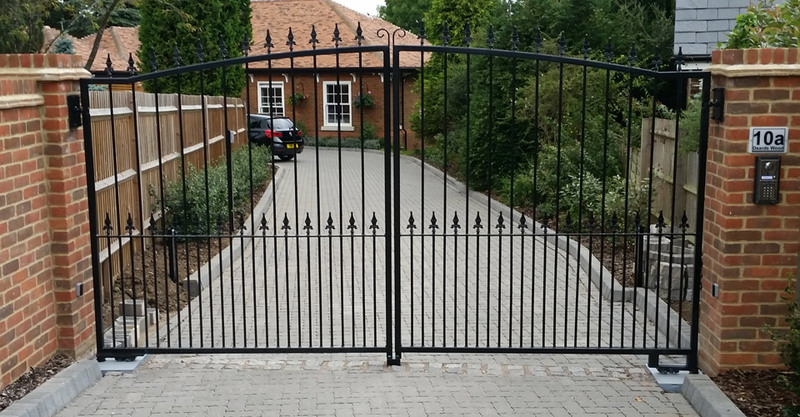 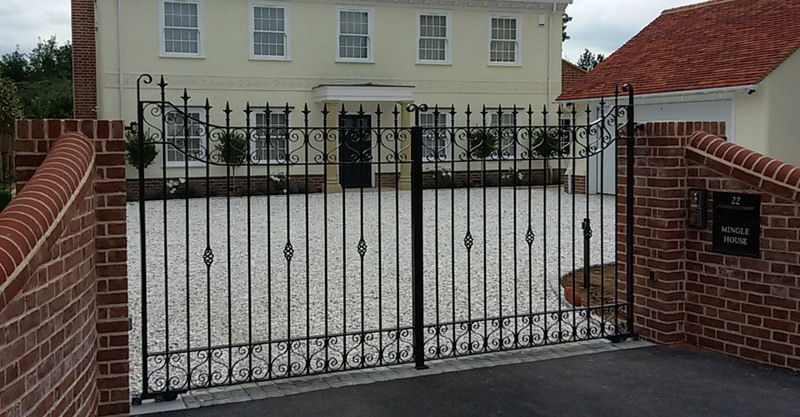 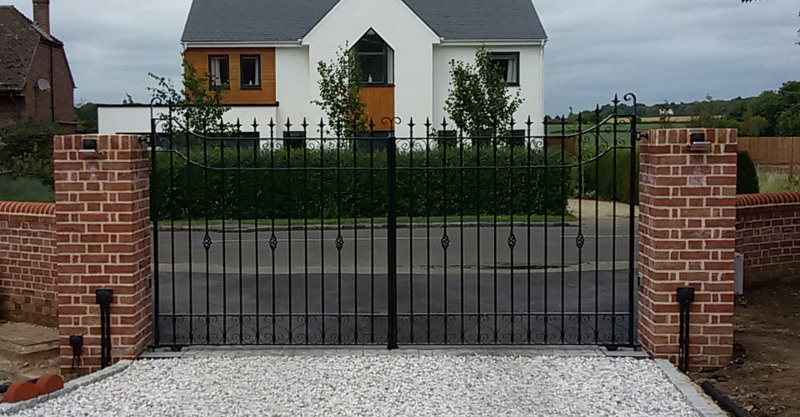 The durability, and traditional look of metal is what makes this material a firm choice for many customers wishing to grace their driveway with something of a little more elegance, without compromising on the level of security it affords. 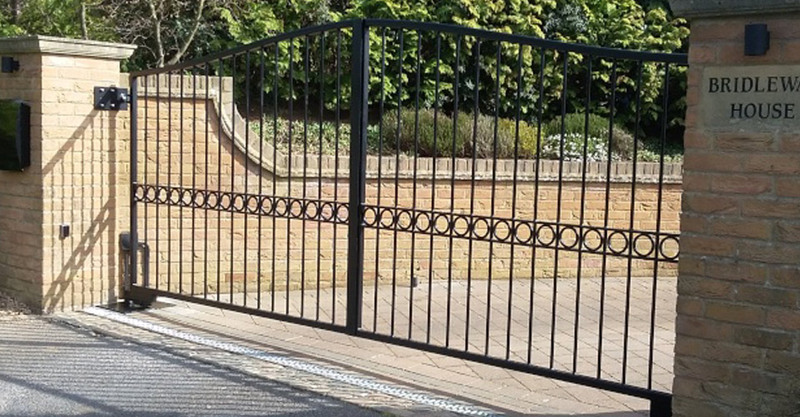 Metal is also virtually maintenance free in terms of having to paint or treat regularly; just a wipe over with a damp cloth will keep your gates looking as good as new for time to come. 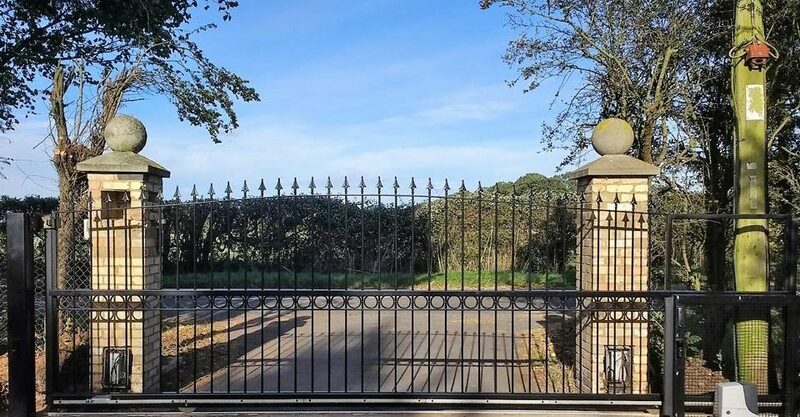 Suitable for many properties, metal is versatile enough to look compelling at a country estate, add character to a small charming property, and give an industrial appearance at a farm or school. 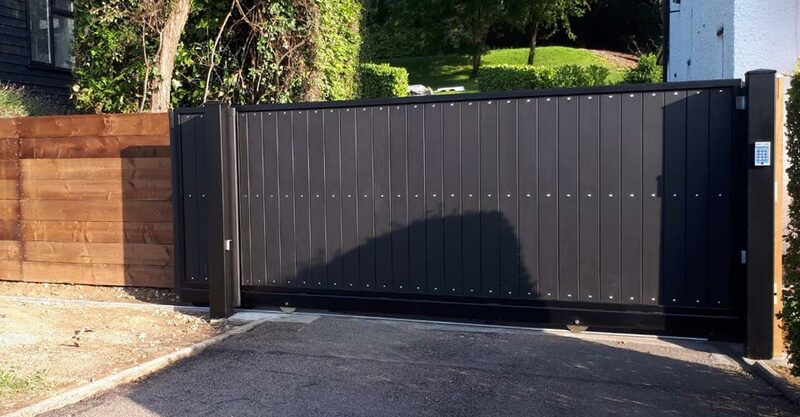 All our metal gates come powder coated in a range of standard colours on the RAL Colour Chart; even if black is your preferred choice, the rail heads that we offer can be in a silver or gold colour to enhance these features. 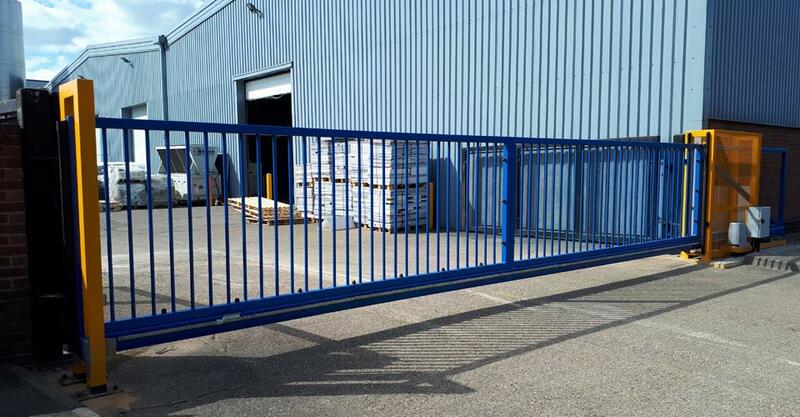 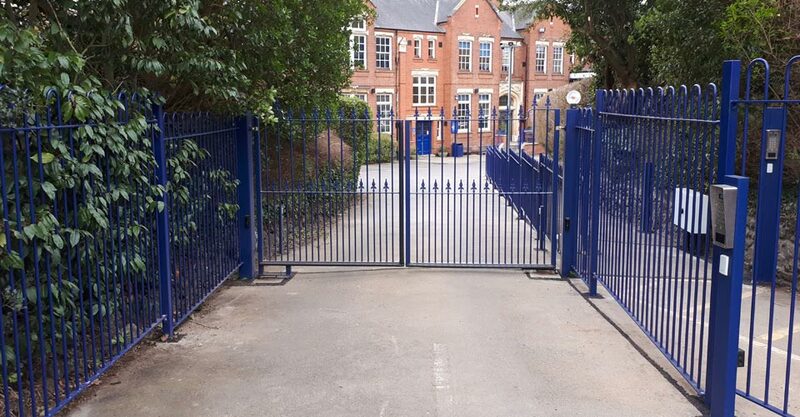 Maximum width for the metal gates is: 5 metres as a pair, 6 metres as a sliding gate, and 10 metres as a cantilever. 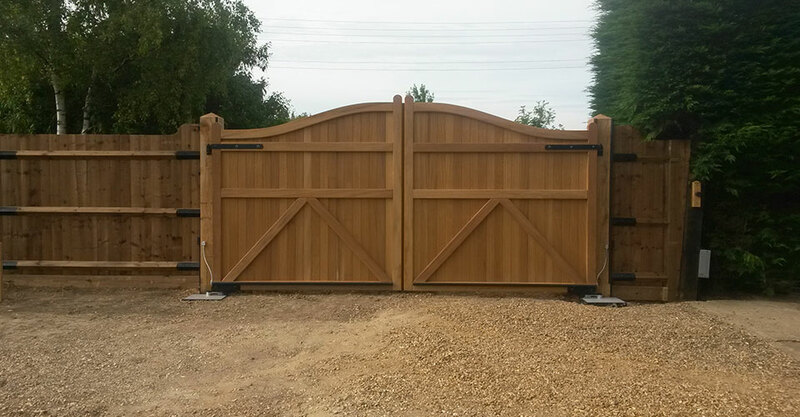 Sturdy gate in a plain, straight-top design to create the perfunctory industrial look. 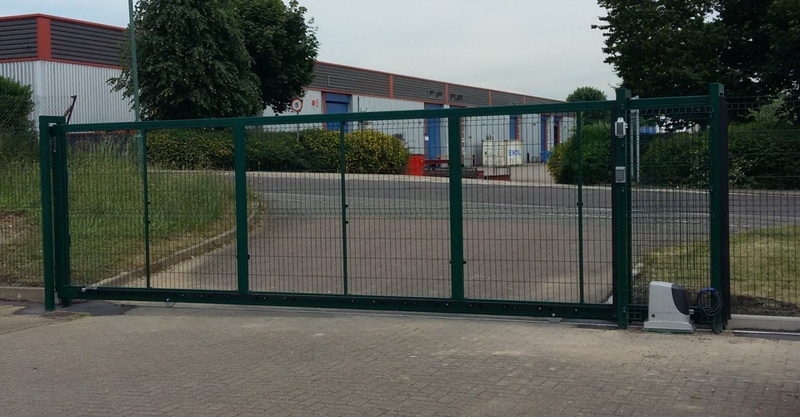 Generally suited to schools, farms, industrial units and office premises. 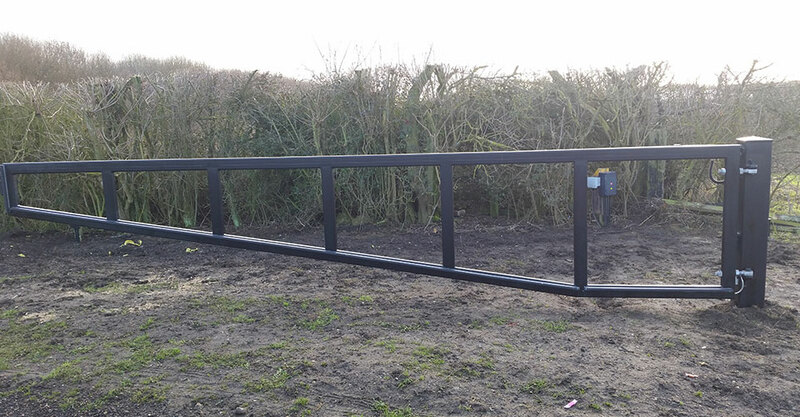 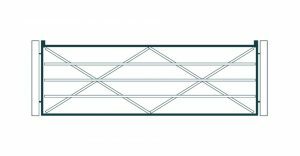 The vertical bars are ideal for keeping livestock/pets/children safe inside your property and for keeping unwanted visitors out! 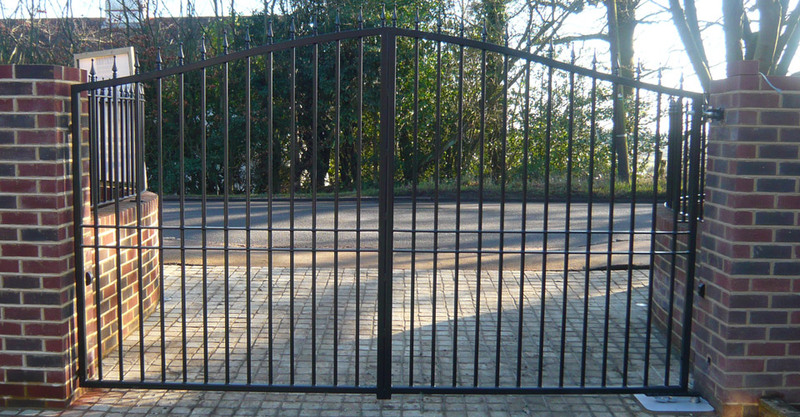 Centre bar runs the width of the gate giving even more rigidity to the structure. 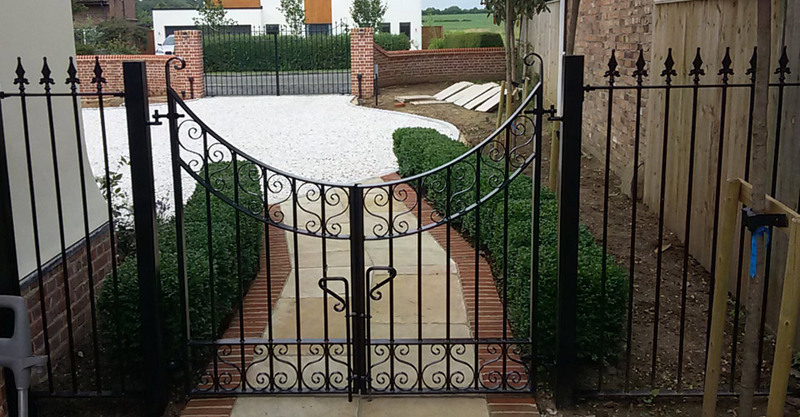 Fleur de lys are available as an optional extra on this design. 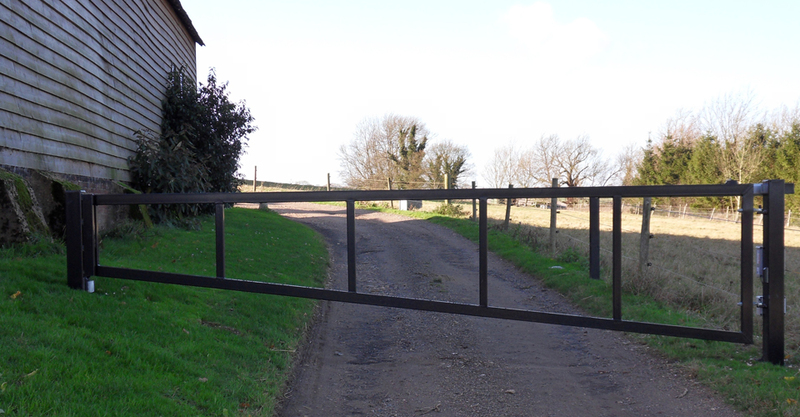 A bow-top variation of the Ashwell, this gate starts lower at each end and rises in the middle to create an upward arch. 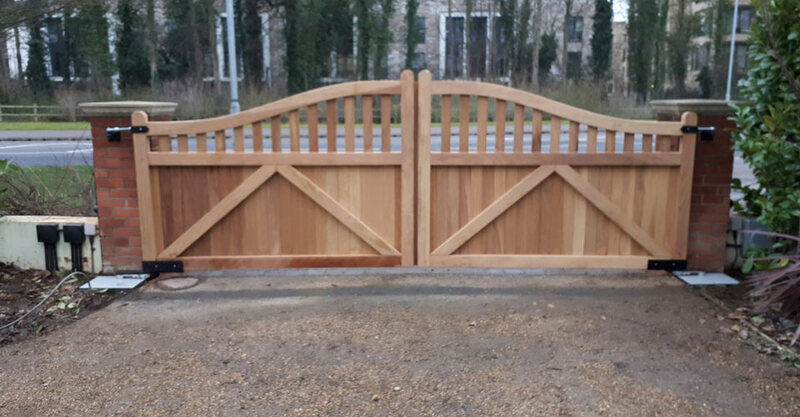 Whilst still of an industrial appearance, the arch makes this gate a suitable choice for any property where a basic, and practical style is required. 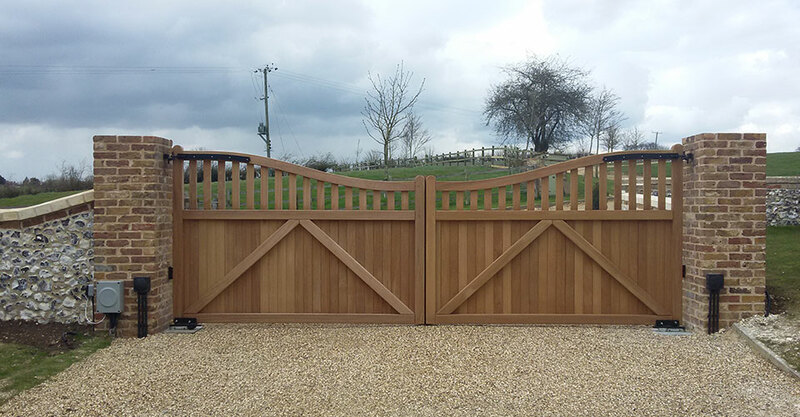 The reverse of the Pelham, the Newport gate starts higher at each end and dips down in the middle, adding character to this plain gate. 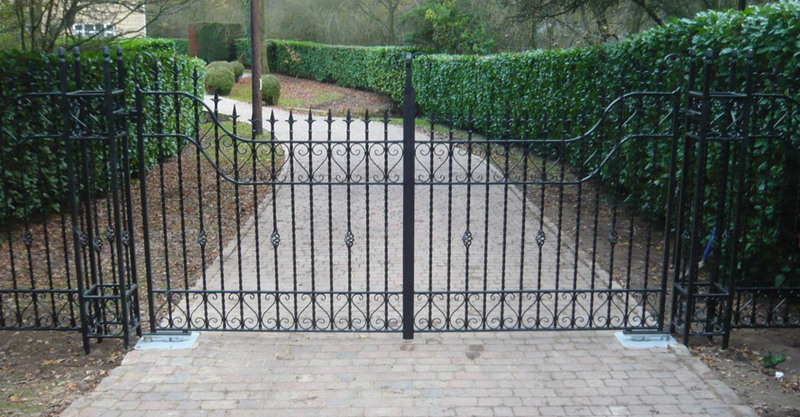 Centre bar runs the width of the gate giving even more rigidity to the metal. 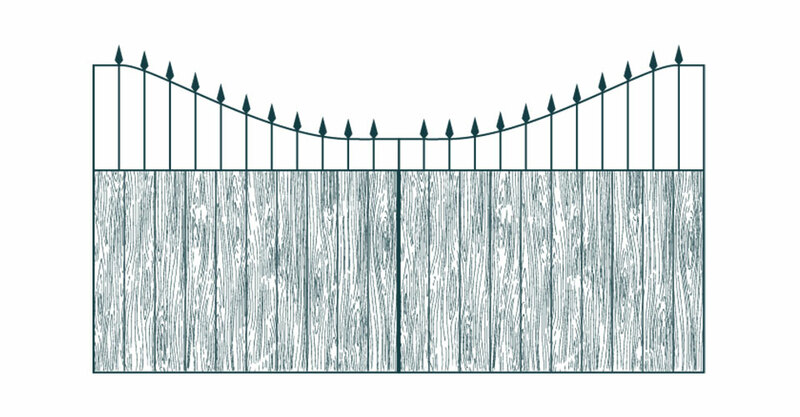 A straight-top metal gate with vertical bars running through the total height of the gate. 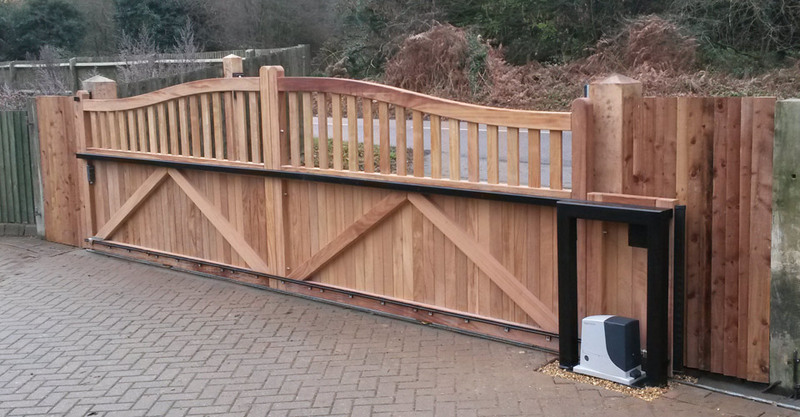 A central mid-rail helps improve the rigidity of this gate. 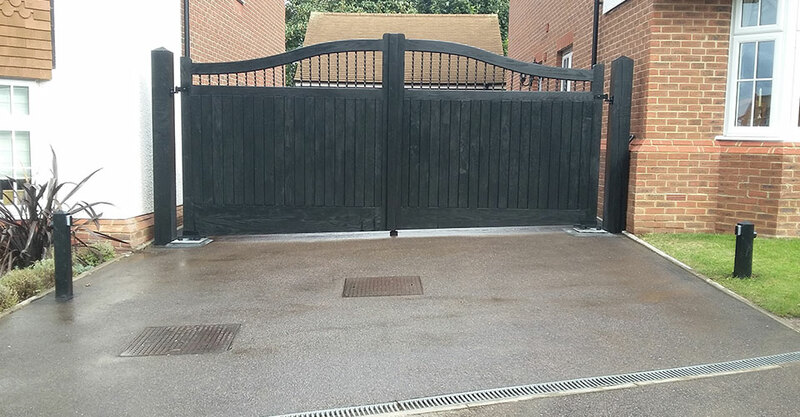 Railheads along the top line and running through the centre rail of this gate create an imposing statement for any driveway entrance. 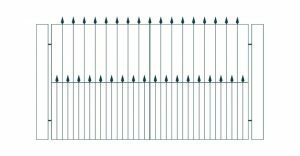 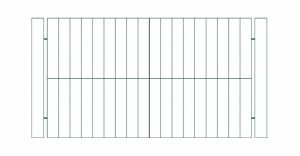 Additional vertical bars are inserted on either side of each of the main bars, narrowing the spacing and making the bottom of this gate appear fuller. 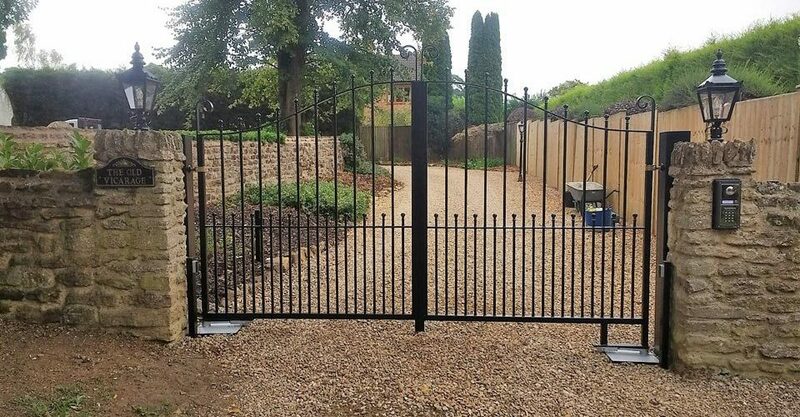 Good for keeping small dogs safe. 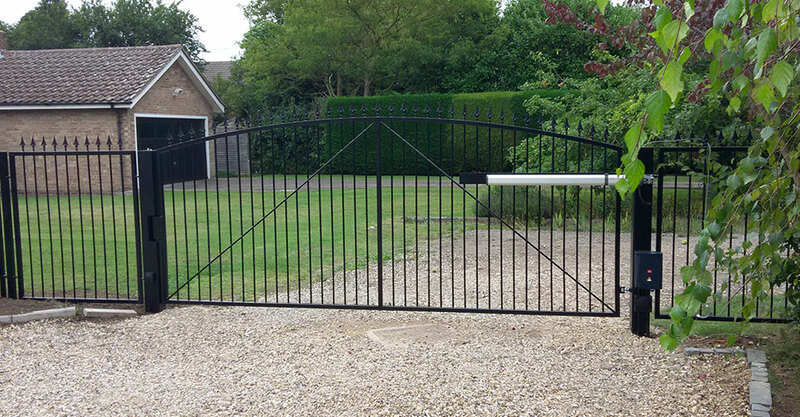 The Tewin gate can be powder coated to any standard RAL colour. 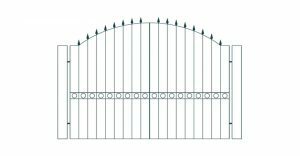 Based on the Tewin gate, the Barkway is a bow-top gate which starts lower at the shoulders and rises in the centre. 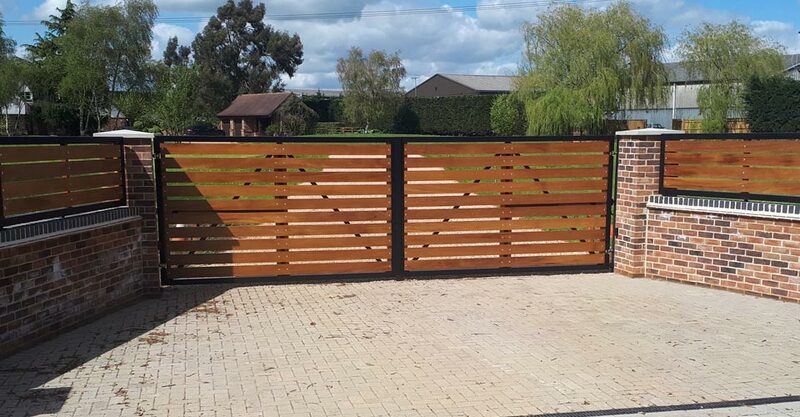 Railheads positioned along the top line and running through the centre rail of this gate create an imposing statement for any driveway entrance. 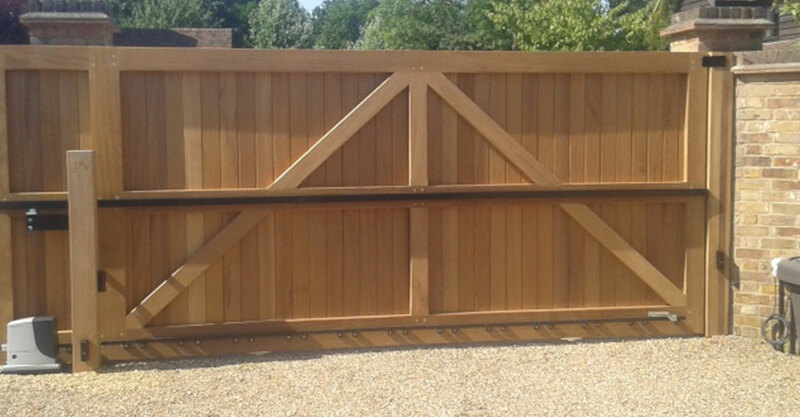 The reverse of the Barkway, the Potton gate style starts higher at either end and dips down in the middle, adding character to this plain gate. 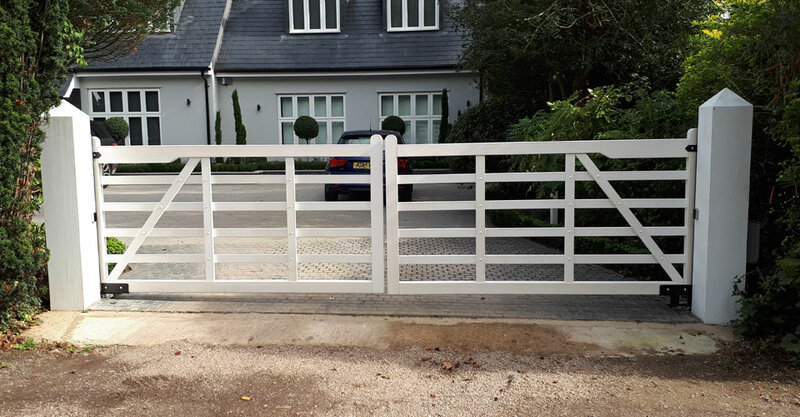 Railheads positioned along the top line and running through the centre rail of this gate make for an imposing statement for any driveway entrance whilst maintaining a sense of elegance. 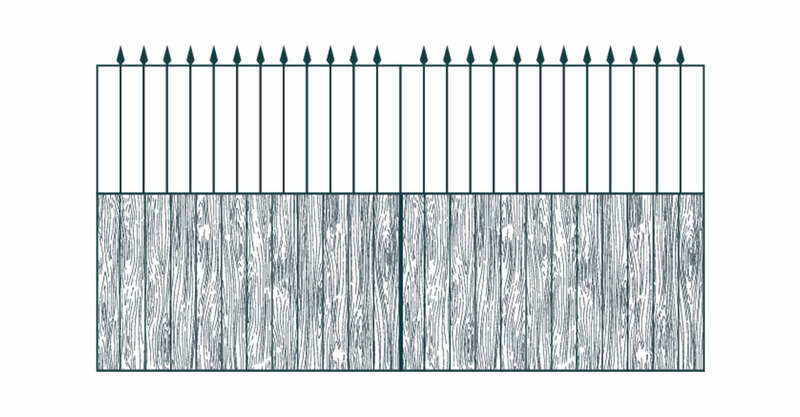 A straight-top metal gate with vertical bars running through the total height. 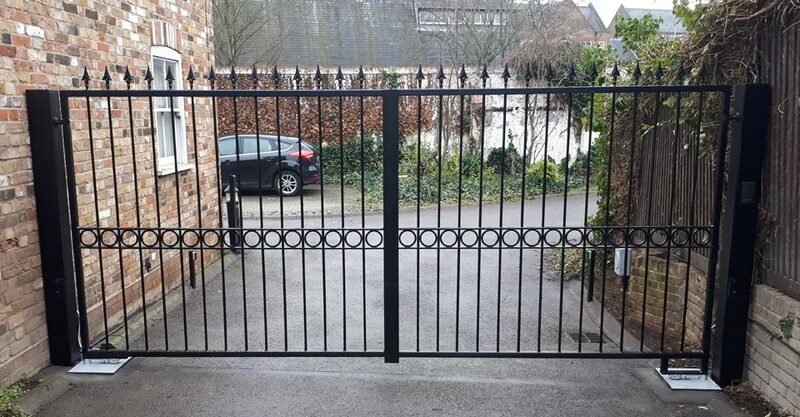 Two central mid-rails spaced evenly adds to the rigidity of the gate. 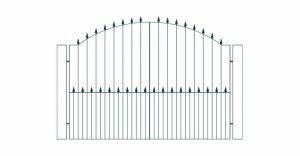 Railheads positioned along the top of the gate enhance the design. 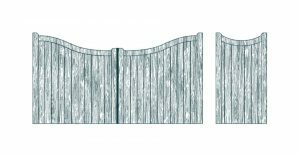 Circles inserted directly into the central mid-rails both soften the appearance of the gate, and complete the overall design. 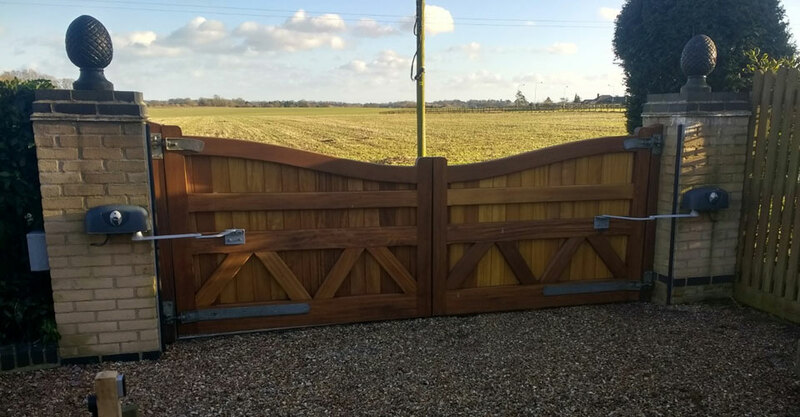 A variation on the Abbotsley, the Harston is a bow-top gate. 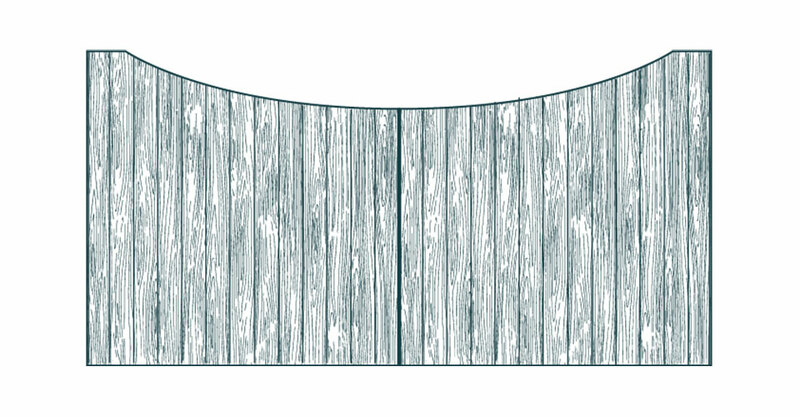 Starting lower at the shoulders and rising up in the centre to create a symmetrical arch along the top line. 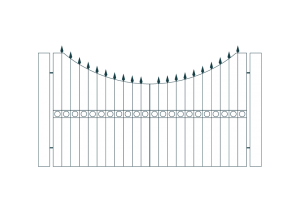 Railheads are positioned along the top of the arch. 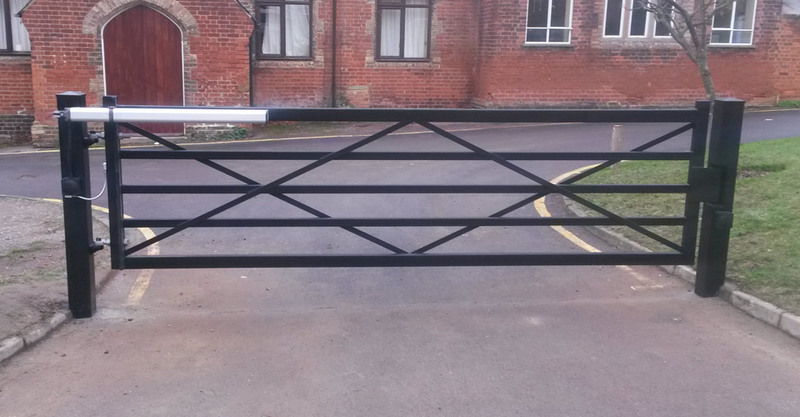 Circles run through the centre mid-rails of this gate to add a little more detail. 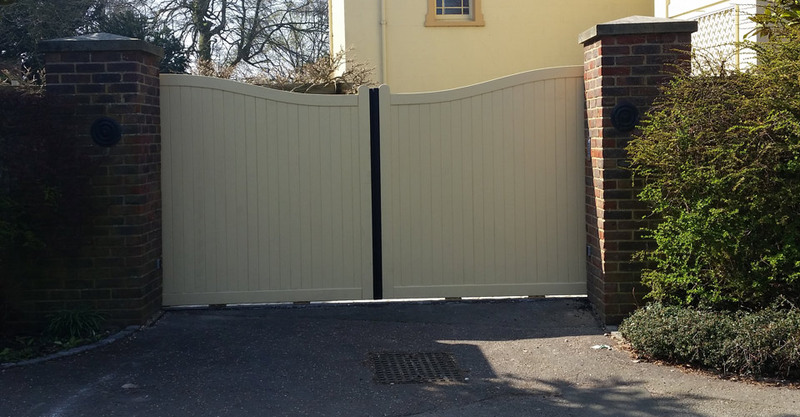 The Harston gate can be powder coated to any standard RAL colour. 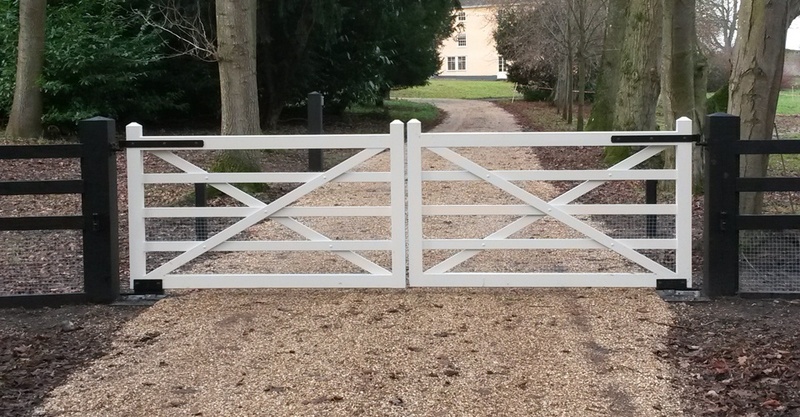 The Wimbish style starts higher at either end of the gate and dips down in the middle, adding character. 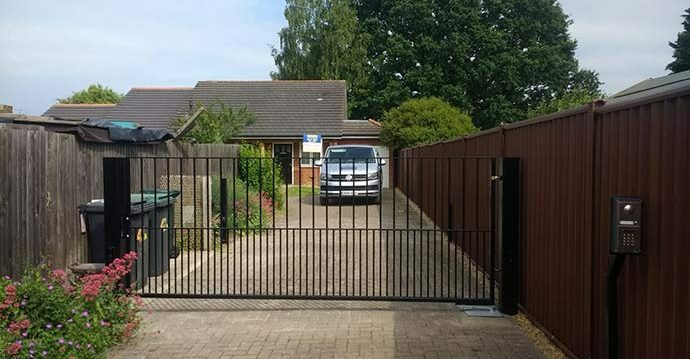 Two equally spaced central metal bars run the width of the gate giving even more rigidity to the metal, and are completed with circles running through the gaps between the vertical bars. 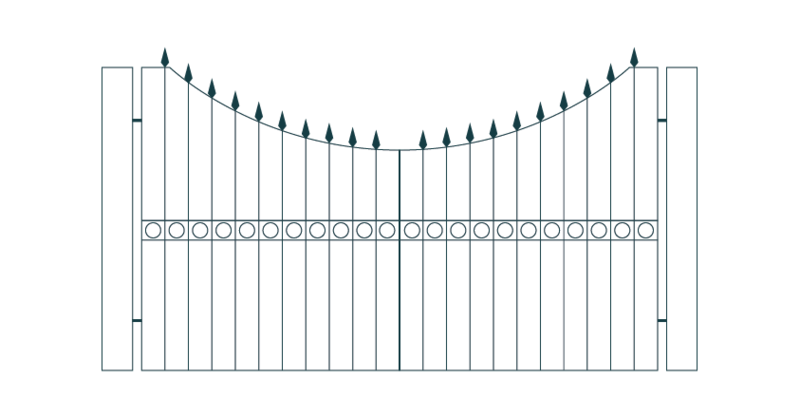 Railheads are positioned along the top line. 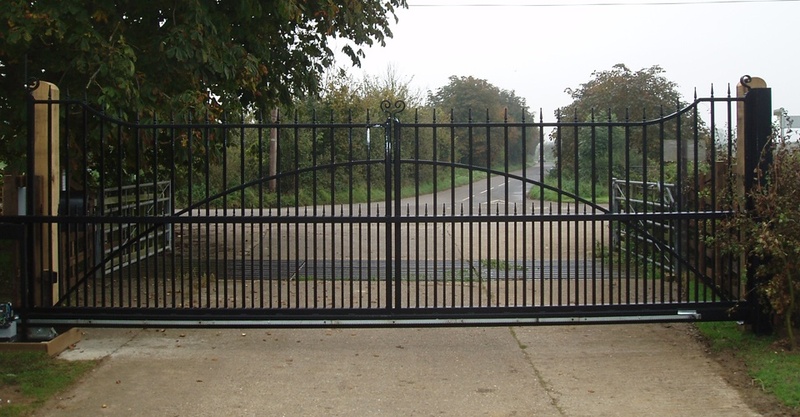 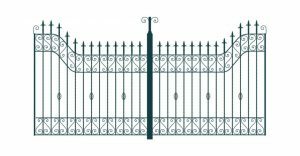 Very similar in design to the Wimbish, the Wicken gate is formed of equally spaced vertical metal bars, and has just one horizontal bar running the length of the gate. 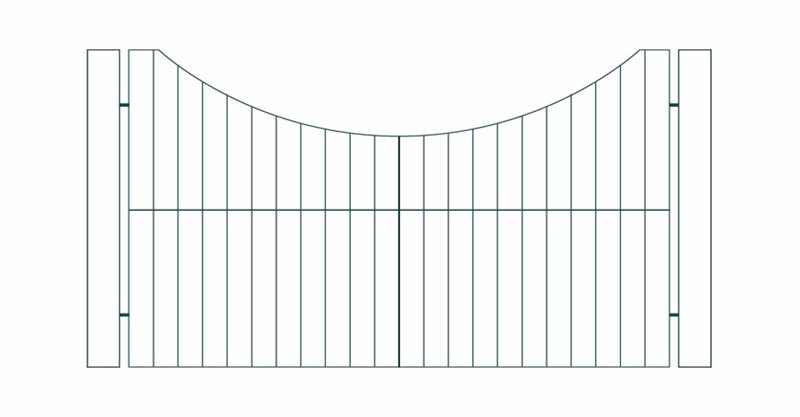 A further bar is added at the bottom of the gate and is formed into an upward arch, which crosses over the central mid-rail at certain points. 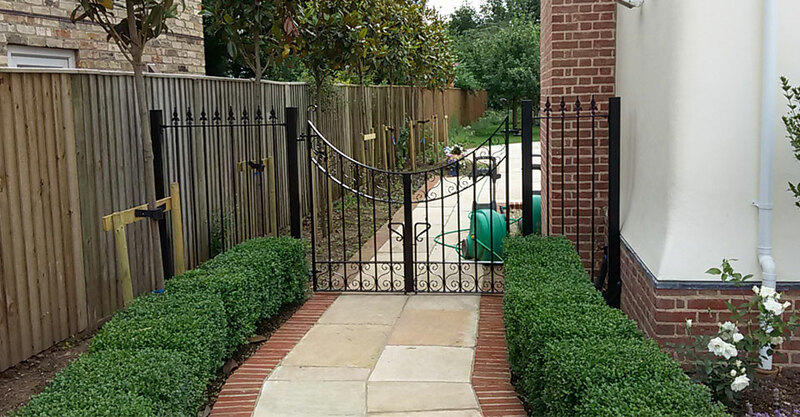 Railheads are positioned along the very top edge of the gate with the additional features of little curled crooks at either end of each gate leaf, giving a softer appearance. 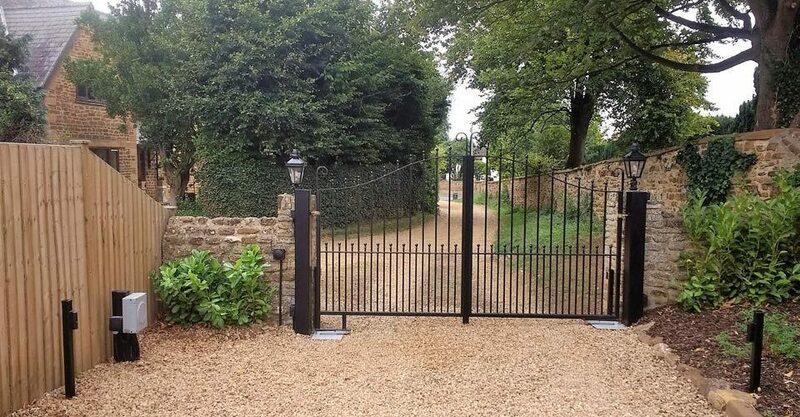 The most elaborate of the metal gate range, the Chelsea gate is all about the design and style. 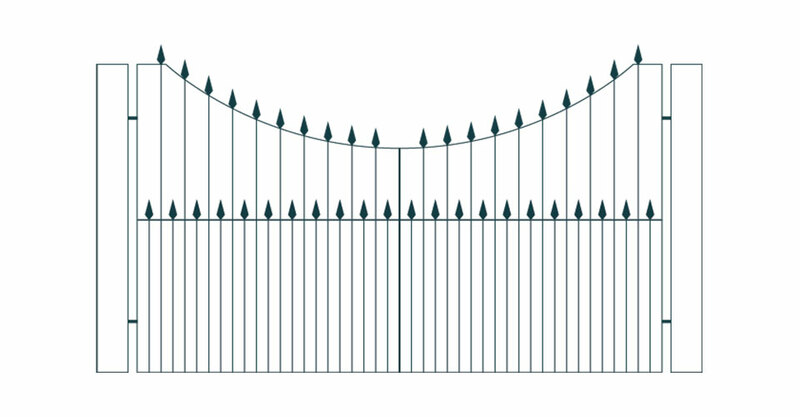 Starting higher at the shoulders and then dipping to a plateaued straight line, this gate also has a further rail, mirroring the top edge of the frame. 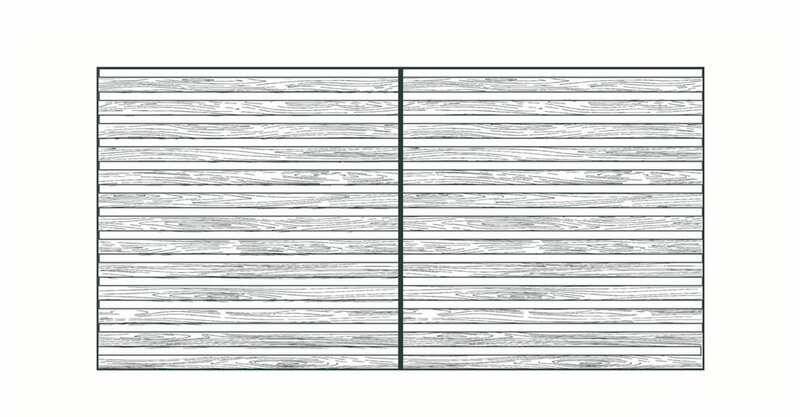 Scrolls are inserted to add another dimension to the design. 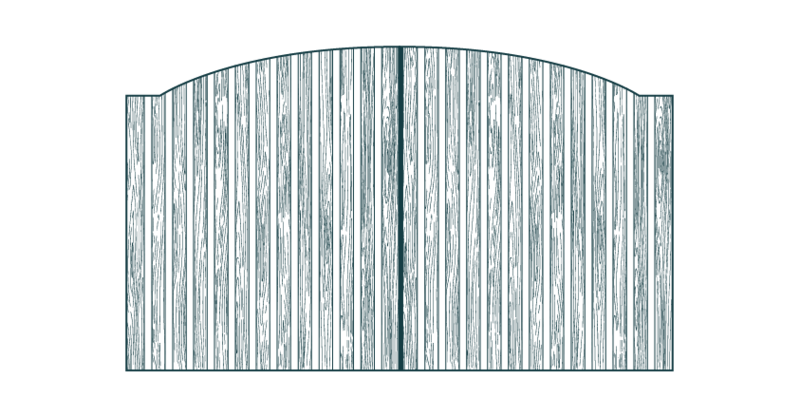 The scrolls are repeated along the bottom edge of the gate frame in the same way as described above. 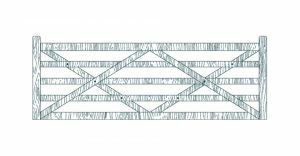 Fleur de Lis railheads complete the finish to the twisted vertical bars. 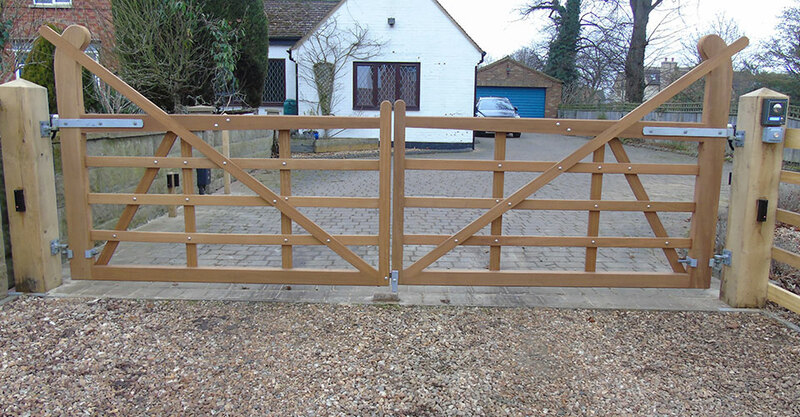 The Reed style is a traditional metal 5 bar field gate. 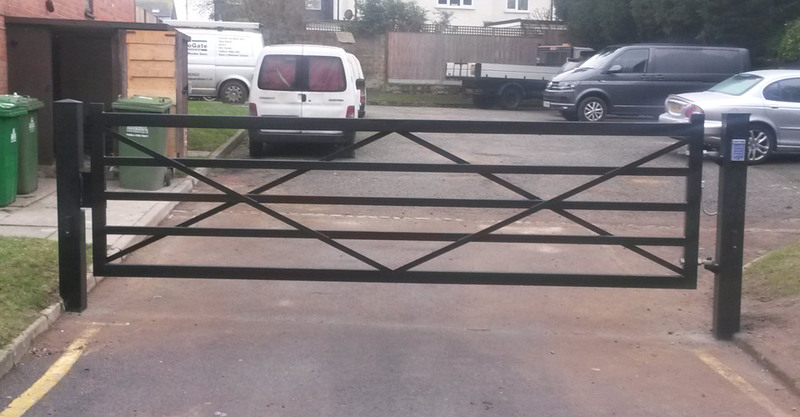 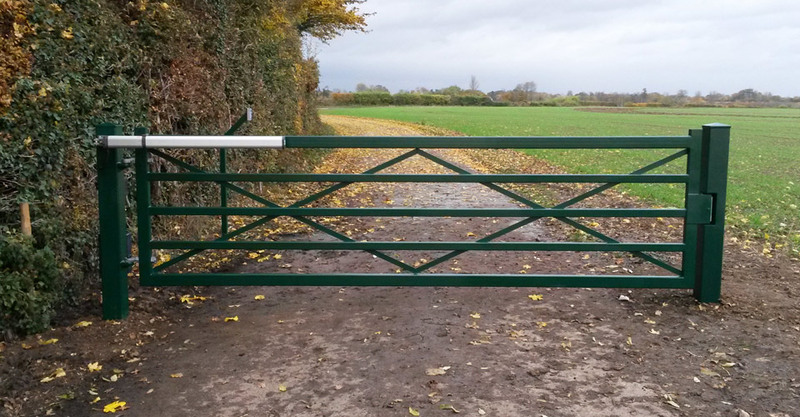 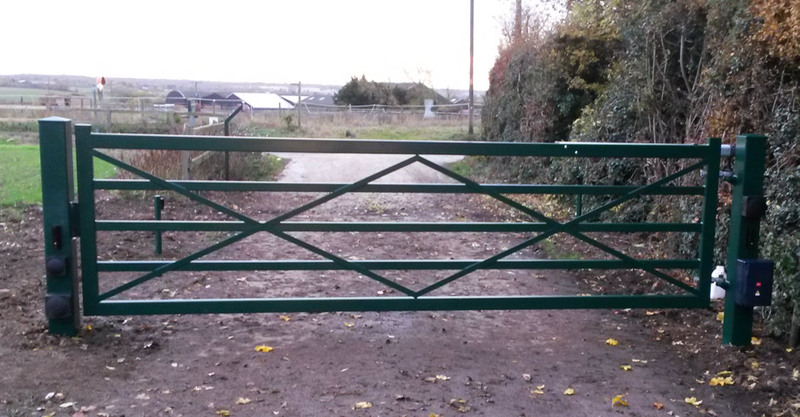 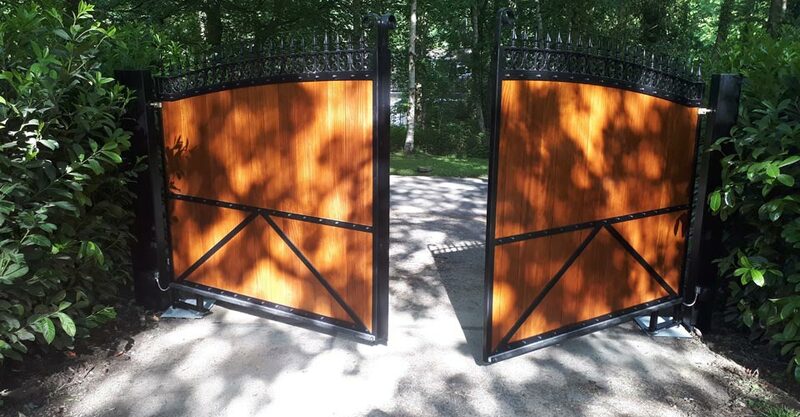 A diamond brace adds a little design variation along with improving the rigidity of this gate. 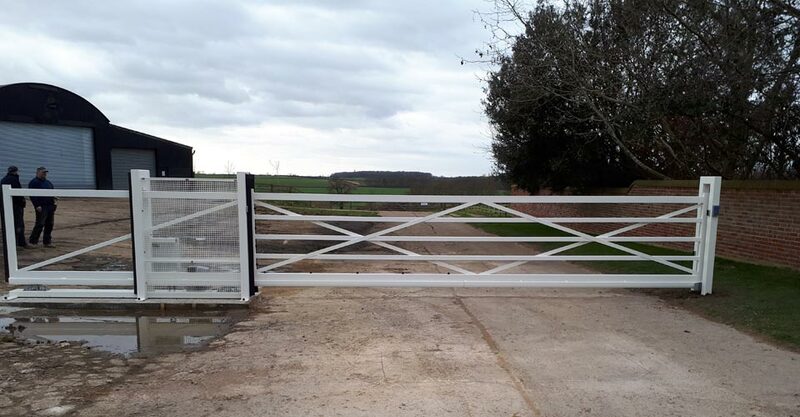 Suitable at farms and properties where maintenance free is a requirement. 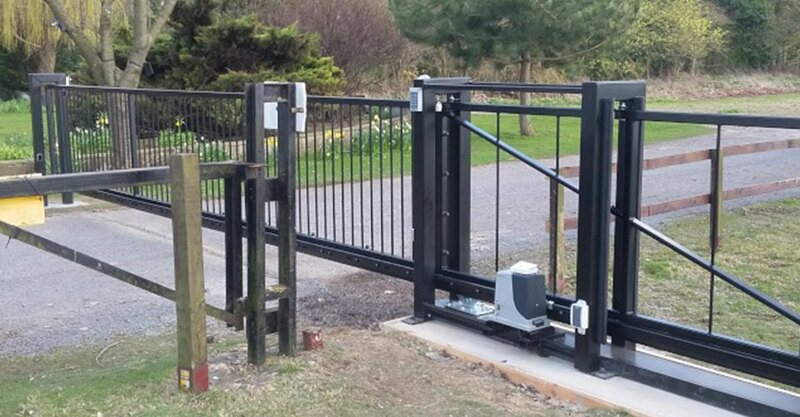 The automation options for the Reed gate include hydraulic arm operators, underground motors, and sliding or cantilever motors. 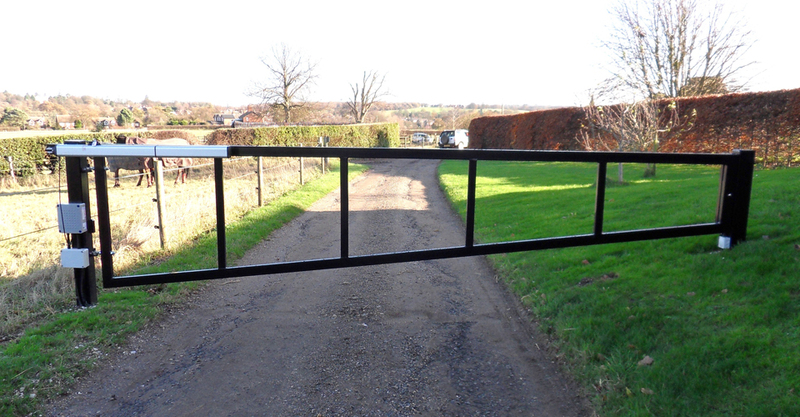 A plain and simple, yet strong farm barrier. 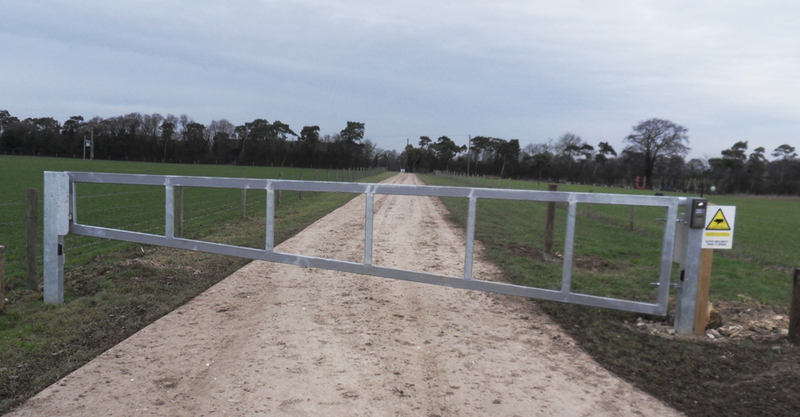 Most suitable deterrent at field entrances to prevent vehicles getting onto site. 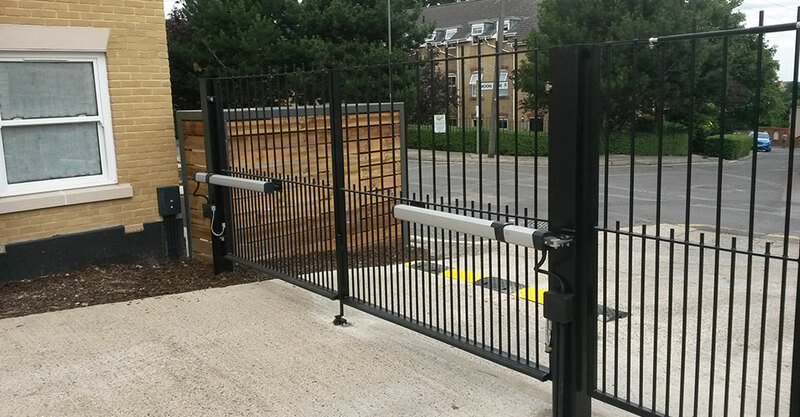 Available as a manual or automated barrier. 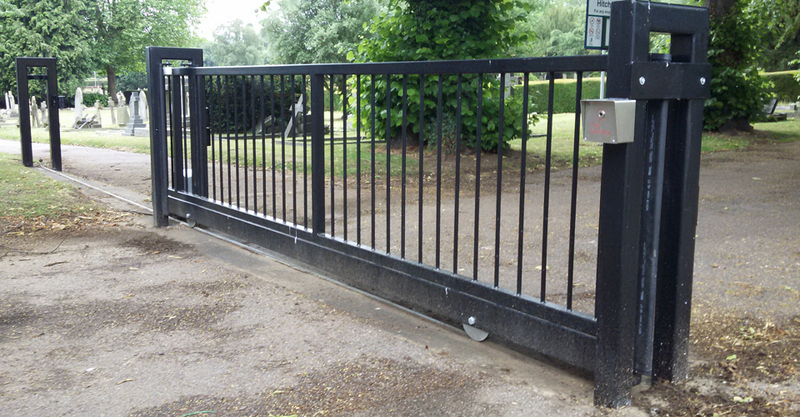 The Barley Barrier can be powder coated to any standard RAL colour. 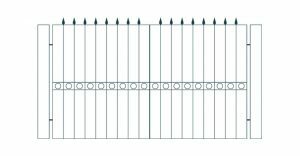 The automation used for the Barley Barrier is a hydraulic arm operator. 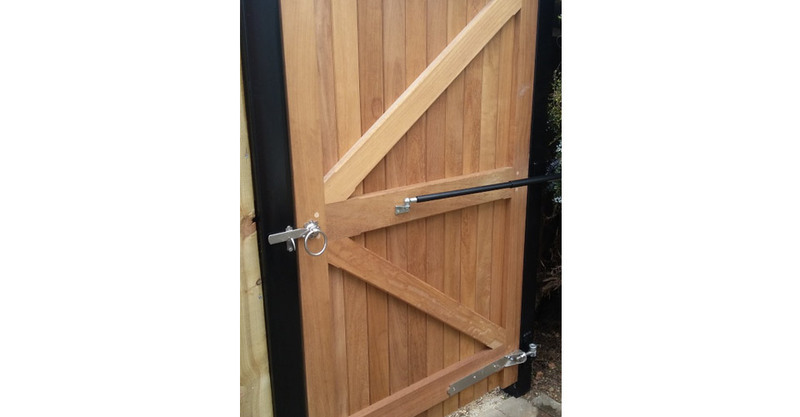 A maglock can be fitted for additional security.